K-Prize badge by WafflesToo (sig badges). 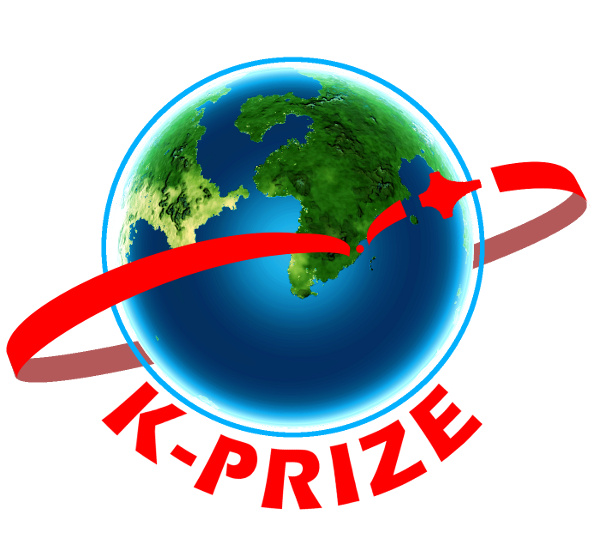 The K Prize challenge is to make the obvious craft, a spaceplane, and make it work. All those who succeed will be included on the roll of honour and get a free back stage pass to hang with Kay Kool and the Kerbettes after their next live performance at the Dog and Booster (where free beer will be available). To enter report relevant accomplishments on a mission which actually flew, your word is good enough but images and videos are welcome. 1. The craft must launch and land intact using only the amount of fuel on board at launch, may not lose stages or parts in flight, no refuelling for thrust, see provisos below. 2. The craft must launch horizontally, reach orbit (PE > 70,000m) and land intact (on Kerbin) ready for 'refuelling'. 3. All fuel tanks, wings (ie lift generators & aerodynamic environments) and engine parts must be stock, for fairness. A. Payloads may decouple from the craft providing all payload tanks are as full on decoupling as at launch and any thrust (or lift) generators on the payload were not used prior to decoupling. Excursion vehicles may decouple and redock but only achievements of the entire craft count towards K-Prize kudos. B. Docking is permitted providing no fuel is transferred (net per fuel type) into the K-Prize craft and then used for propulsion (it can be transferred out or in as payload). Likewise no propulsion assist is permitted from the target craft fuel or engines. Crew transfers are permitted. C. Mining and refining are permitted providing none of the resulting fuel product is used to drive the craft i.e. mined fuel is treated as payload only. D. Pilots wishing to try the challenge with mod equipment may do so in the sister challenge thread "The K Prize - 100% reusable spaceplane to orbit and back (Modded Version)". 1. 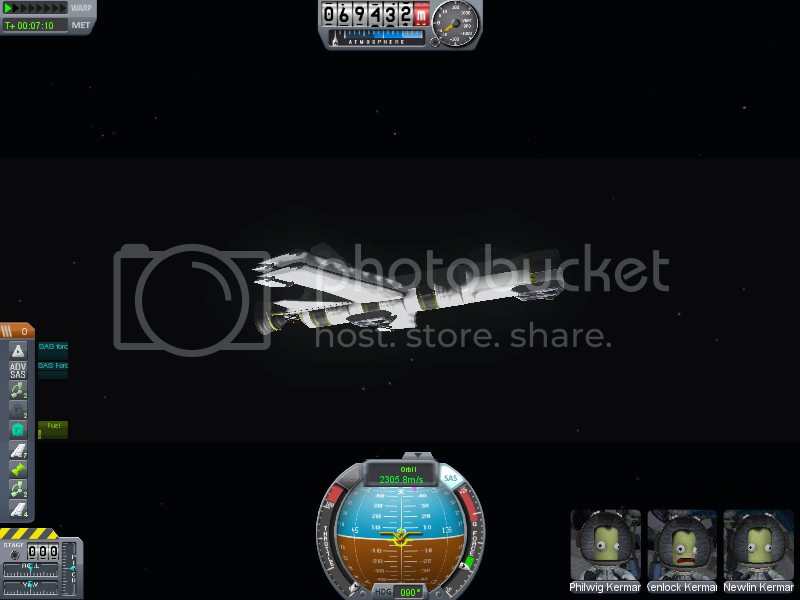 Smallest ship (by weight, weight info required). Minimalist record. 2. Largest ship (by weight, weight info required). Maximalist record. 3. 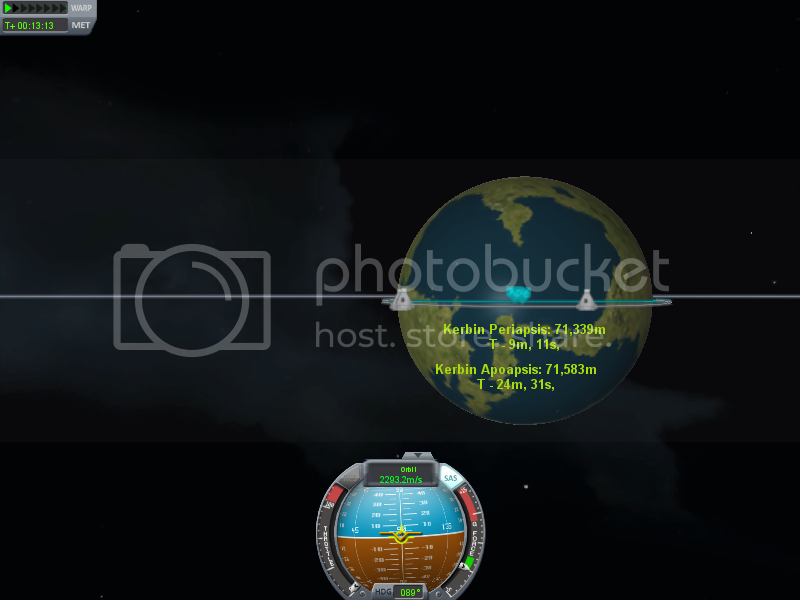 Highest orbit beyond Eeloo. Altitudinalist record. 4. 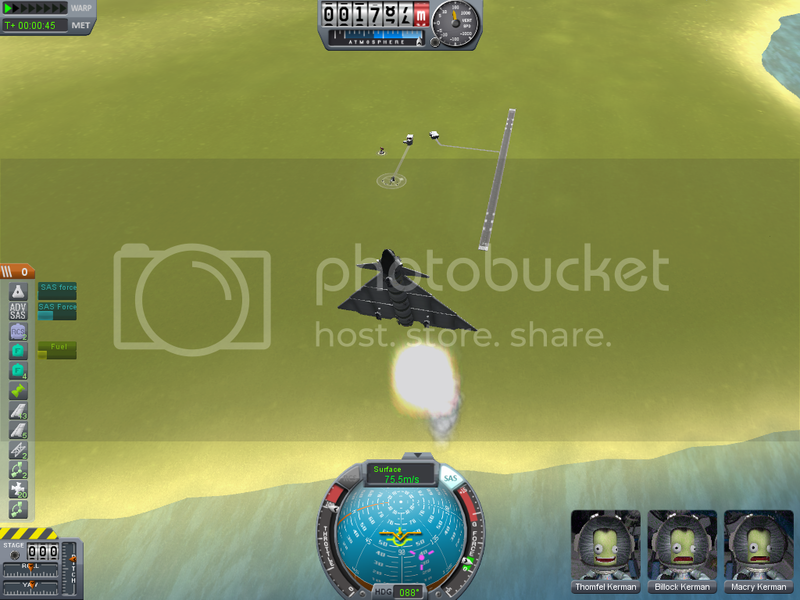 Landing on KSC terrain. Pilot proficiency medal. 5. 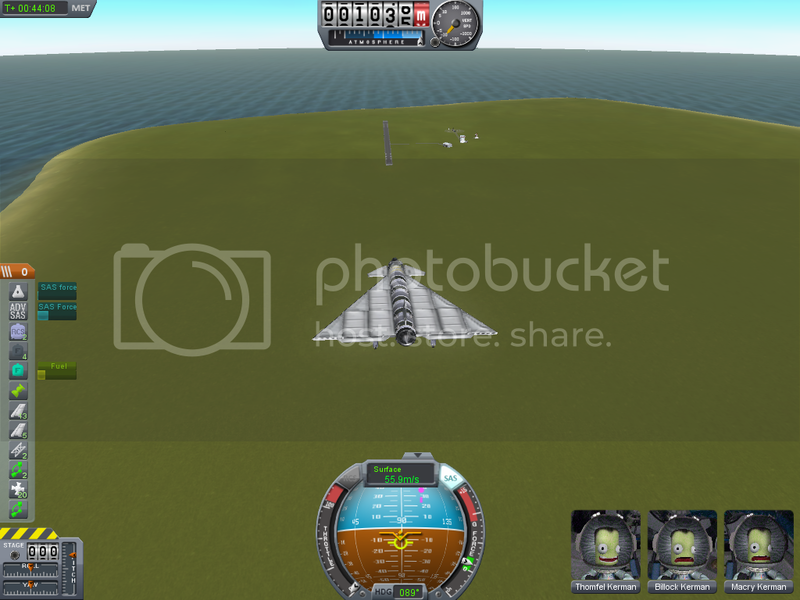 Landing on any KSC runway or docking in orbit. Advanced pilot precision award (1stClass for both). 6. Visiting other SOIs. Kosmokerbal Commendation. 7. Planetoid landings. Astrokerbal Distinction. 8. 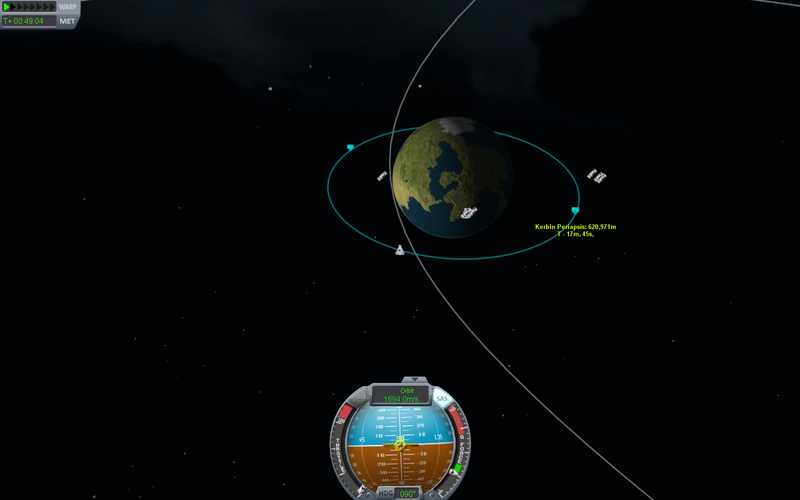 Payload to orbit, including fuel transfer out also mined product or fuel store to Kerbin from asteroid. Utilitarial Commendation. 9. 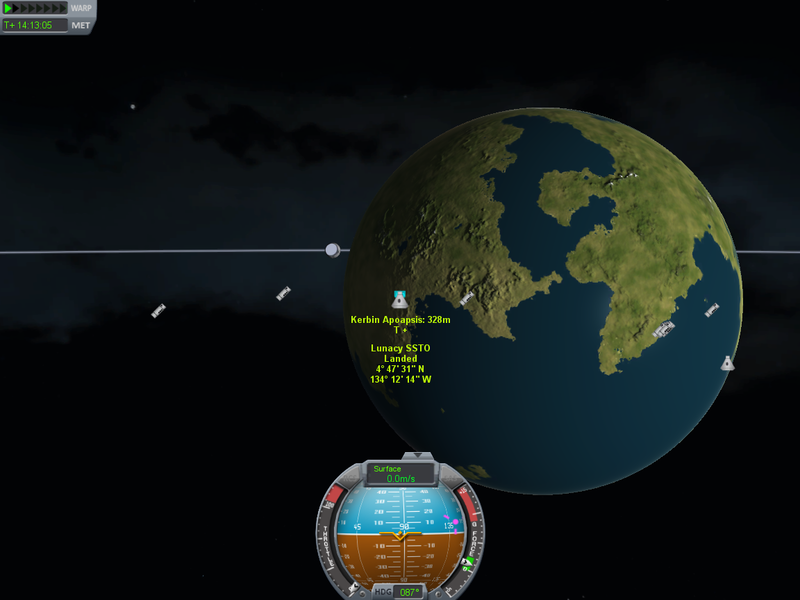 Payload to distant planet surface including fuel transfer out also mined product or fuel store to Kerbin from planet. Utilitarial Distinction. Kertech Advanced Pilot Precision Award with with Laythe Dragon 3. - Utilitarial Commendation, Advanced Pilot Precision Award with Sickle mk 2. Workable Goblin Advanced Pilot Precision Award with QS-1 Needletail light SSTO. ChaoticPhoenix Utilitarial Commendation, Advanced Pilot Precision Award with Tanto. n.b.z. Advanced Pilot Precision Award with Bonkers Bonsai. cikho Utilitarial Commendation, Advanced Pilot Precision Award 1st Class with SSTO_Perrier. RCgothic Advanced Pilot Precision Award with SSTO. - Utilitarial Commendation, Advanced Pilot Precision Award 1st Class with SSTO. NoobTool Utilitarial Commendation (236.8t), Advanced Pilot Precision Award with Czar Galactica MK 3 EX. - Utilitarial Commendation (301.8t), Advanced Pilot Precision Award with Czar Galactica MK 4. - (1325t), Utilitarial Commendation (476.8t), Advanced Pilot Precision Award with Czar Galactica MK 5. EliteGuy3 Utilitarial Commendation, Pilot Proficiency Medal with Jeremiah (5.996t). - with Binoree I (1.910t). something Advanced Pilot Precision Award 1st Class with Heimdal. - Advanced Pilot Precision Award with Erwin. boolybooly Advanced Pilot Precision Award with Whiplash PT. - Utilitarial Commendation, Advanced Pilot Precision Award with Hefty. - Advanced Pilot Precision Award with Gogitem. Kergarin Utilitarial Commendation (Duna Train : video), Advanced Pilot Precision Award with Crossbow SSTO. W. Kerman Advanced Pilot Precision Award with \(*)/Bird, (cyclopean bird). rkarmark Advanced Pilot Precision Award with SSTO. Eidahlil Advanced Pilot Precision Award with Reed. Cherubiel Advanced Pilot Precision Award with Spaceplane Alpha One. - with Kolibri II (4.277t). - with Kärbä III (1.295t). Eidahlil Advanced Pilot Precision Award with Bulbous (0.920t). Hodari Advanced Pilot Precision Award 1st Class with X-1. Major Tom Advanced Pilot Precision Award with Full-of-Stars Mk1. Harry Seaward Advanced Pilot Precision Award x2 (east and west) with SSTO. Speeding Mullet Advanced Pilot Precision Award 1st Class, Utilitarial Commendation (Mün), Kosmokerbal Commendation (Mün & Minmus) with Mullet Dyne Crosswing (Variant 5). tosha Advanced Pilot Precision Award with Pheonix 1.4. Samniss Arandeen Advanced Pilot Precision Award 1st Class with Project Crossbow. qzgy Pilot Proficiency Medal, Utilitarial Commendation with Swedish Fish. Suicidal Insanity Advanced Pilot Precision Award, Utilitarial Commendation with Atlas. - Advanced Pilot Precision Award 1st Class with Flamespear Mk2. Thor Wotansen Utilitarial Commendation with craft with no name. - Advanced Pilot Precision Award, Utilitarial Commendation (36t) with Róta. Space Yorkie with X-13 Greyhound II Spaceplane. Numerlor Utilitarial Commendation with SSTO2. Ozelui Advanced Pilot Precision Award 1st Class, Utilitarial Commendation with Beluga mk5. Luizopiloto Advanced Pilot Precision Award, Utilitarial Commendation (Mün) with X-98L BlueJay (video). Special homemade IVA dashboard award. Mjp1050 Utilitarial Commendation with Excelsior. overkill13 Advanced Pilot Precision Award 1st Class, Utilitarial Commendation with Panther II cargo SSTO. voicey99 Expeditionary Utilitarial Distinction (Duna) with Yate Haugan. Mr. Me Advanced Pilot Precision Award with Freebird SSTO. ForScience6686 Pilot proficiency meda with Convertible. Scarecrow Advanced Pilot Precision Award 1st Class with Jeb's Limo. - Utilitarial Commendation, Advanced Pilot Precision Award with Blackbird SSTO. - Advanced Pilot Precision Award with X-Wing (video). JoeNapalm Advanced Pilot Precision Award with Vampire Mk1 SSTO. JYNg Advanced Pilot Precision Award 1st Class with Kaiser 4. Skylon Advanced Pilot Precision Award with STP-2 'Javelin' Trainer Spaceplane. Fulgora with Minimalist SSTO 5. JacobJHC Advanced Pilot Precision Award, Expeditionary Astrokerbal Distinction with Dres SSTO. - Advanced Pilot Precision Award, Expeditionary Kosmokerbal Commendation (Duna++) with the I don't know if this SSTO has enough fuel. - Exploratory Astrokerbal Distinction with Gilly SSTO (12.203t). - Expeditionary Astrokerbal Distinction (Eeloo) with Rei III SSTO. - Utilitarial Commendation (324t), Advanced Pilot Precision Award with Heavy Cargo SSTO. Invisifly2 Utilitarial Commendation with Sparrow. 53miner53 Kosmokerbal Commendation (Mün) with SSTO 1. Joseph Kerman Advanced Pilot Precision Award with SF-01 Falcon. zanie420 Exploratory Astrokerbal Distinction, Utilitarial Distinction (Gilly) with Klementine. Spaceception Advanced Pilot Precision Award with SSTO. herbal space program Advanced Pilot Precision Award, Expeditionary Astrokerbal Distinction (Duna) with Duna Moth. Skystorm Advanced Pilot Precision Award, Utilitarial Commendation with the spaceplane with no name. Laie Advanced Pilot Precision Award 1st Class with Clipper. - Expeditionary Astrokerbal Distinction (Duna), Advanced Pilot Precision Award with Flying Wing Kind of Thing. g00bd0g Advanced Pilot Precision Award with Mk2 SSTO. - Utilitarial Commendation (72t), Advanced Pilot Precision Award with Mk3 Cargo. panelledberry Kosmokerbal Commendation (Mün & Minus) with Fang V4. - Expeditionary Astrokerbal Distinction (Duna) with Farscape V2. - Advanced Pilot Precision Award with Aegis V6. panzerkneof Pilot Proficiency Medal with Adrenal-S.
Secuas Utilitarial Commendation (36t), Advanced Pilot Precision Award with Magical Trailblazer. HamnavoePer Advanced Pilot Precision Award with My First SSTO. Edax Advanced Pilot Precision Award with Thunderbolt II. TheFlyingKerman Advanced Pilot Precision Award with the HKA-3A. - Utilitarial Commendation, Advanced Pilot Precision Award with HKA-4B. - Utilitarial Commendation, Advanced Pilot Precision Award 1st Class with HKA-6B. - Utilitarial Commendation (Minmus), Advanced Pilot Precision Award with HKA-6B. sh1pman Utilitarial Commendation (144t), Advanced Pilot Precision Award with Atlas XXL-144 K-Prize. McBalsam Expeditionary Astrokerbal Distinction (Eeloo & Minmus), Advanced Pilot Precision Award with, 136 seat space liner Ahti II. 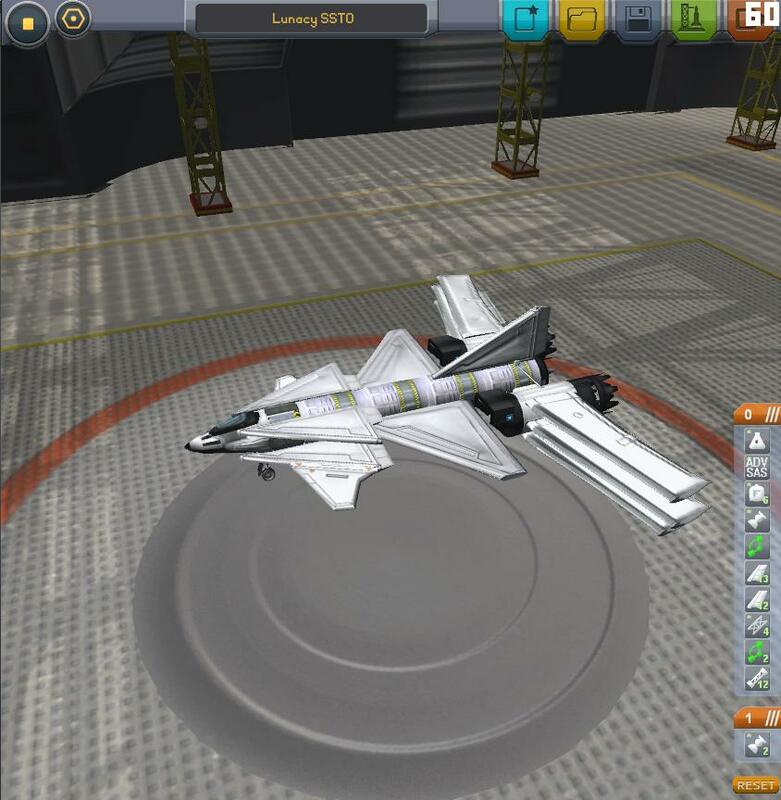 Steel Starling Utilitarial Commendation, Advanced Pilot Precision Award with SI-SSTO-4 "The Sky's the Limit Cargo Edition". Magzimum Advanced Pilot Precision Award with Spacebus. XB-70A Advanced Pilot Precision Award 1st Class with Pallas. Dark Lion Advanced Pilot Precision Award with Storm. HamnavoePer Advanced Pilot Precision Award with Kerbero V.
The Moose In Your House with Sepia Siren. Freshmeat Utilitarial Commendation, Advanced Pilot Precision Award 1st Class with Grey Goose. Andetch Pilot Proficiency Medal with Cave SSTO. - Kosmokerbal Commendation (Mün), Advanced Pilot Precision Award with Skydart (video). alex50caliber Advanced Pilot Precision Award with Ampsk-1S. XLjedi Advanced Pilot Precision Award with SR-13 Venom. Box of Stardust Advanced Pilot Precision Award with AS-3A Skystreak. Bitrefresh Utilitarial Commendation, Advanced Pilot Precision Award with Griffon Mark II. - Utilitarial Commendation, Advanced Pilot Precision Award 1st Class with Condor Mark VII. - Advanced Pilot Precision Award with Merlin Mark VII. hoioh Utilitarial Commendation, Advanced Pilot Precision Award with By_The_Book. beomagi Advanced Pilot Precision Award with SP-4800. - Astrokerbal Distinction (Minmus), Advanced Pilot Precision Award 1st Class with SP-6000. doggonemess Advanced Pilot Precision Award with Mk2 SSTO Quad. Kerbal Design Bureau Advanced Pilot Precision Award with KDB-SSTO-I. Loompar Advanced Pilot Precision Award with The Challenger (video). Kerbolitto Utilitarial Distinction (Mün), Advanced Pilot Precision Award with Cheval mk4-3. SpaceAdmiral Advanced Pilot Precision Award with SSTO Prototype 2.
sturmhauke Advanced Pilot Precision Award 1st Class with the Flying Vee. BigFatStupidHead Advanced Pilot Precision Award with The Bump and Grind. ValCab33 Utilitarial Commendation, Advanced Pilot Precision Award 1st Class with Pegasus VI. PrvDancer85 Exploratory Astrokerbal Distinction (Ike), Advanced Pilot Precision Award with LfoOnly3. Hydrothermalventclam Advanced Pilot Precision Award 1st Class with the OV-01 Kestrel. Mjp1050 Advanced Pilot Precision Award with Moustache. AVeryNiceSpacePenguin Advanced Pilot Precision Award with X-20 Dynasoar SSTO. JacobTheFoxx Pilot Proficiency Medal with SpeedyBoi V1. Aquaticfantastic Advanced Pilot Precision Award 1st Class with the R8-ZR. - Utilitarial Commendation, Advanced Pilot Precision Award 1st Class with the R8-ZR. Tallinu Utilitarial Commendation, Advanced Pilot Precision Award 1st Class with Prometheus Low Tech SSTO (video). purpleivan Utilitarial Commendation, Advanced Pilot Precision Award 1st Class with Space Plane K.
GRS Advanced Pilot Precision Award with Proto Taxis 2. KerbalRocket with Untitled Space Craft. Aeroboi maximalist record holder (2,797.278 t), Utilitarial Commendation (1,485.8 t), Advanced Pilot Precision Award with Hearts Chevron 96 Cargo Lifter. eloquentJane Utilitarial Commendation with S1 Shooting Star. HebaruSan Utilitarial Commendation, Advanced Pilot Precision Award with Femtolander 1.1.
mesilliac Advanced Pilot Precision Award with Little Oneleg (minimalist record holder 1.43t). 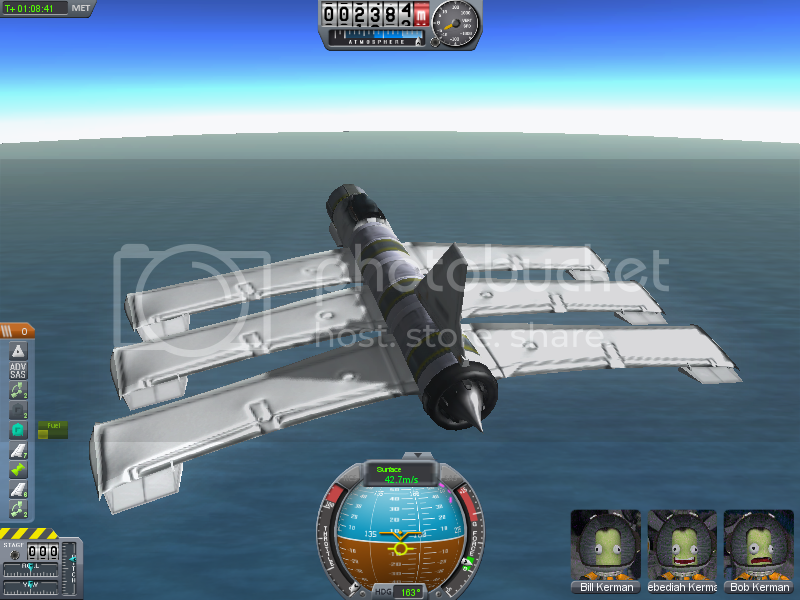 Jetski Advanced Pilot Precision Award with SSTO. mk1980 Advanced Pilot Precision Award 1st Class with Startours 2. - Expeditionary Astrokerbal Distinction with Candlesticks. - Utilitarial Commendation (96.41t), Pilot Proficiency Medal with Winged Nightmare. Kergarin Advanced Pilot Precision Award with MK1 Mini SSTO. - Advanced Pilot Precision Award with MK3 SSTO "Super Short Shuttle"
- Utilitarial Commendation (36t), Advanced Pilot Precision Award with MK3 Z2 cargo drone "Zeppelin Winglift". - 2x Utilitarial Commendation (36t), Advanced Pilot Precision Award with MK3 Z2D cargo drone. - Advanced Pilot Precision Award with Experimental X-Thing SSTO. - Advanced Pilot Precision Award with POD1 SSTO V2. - Advanced Pilot Precision Award with SSSTO1. - Advanced Pilot Precision Award 1st Class with DELTA6 LF. Prieblander 2x Utilitarial Commendation, Advanced Pilot Precision Award 1st Class with SSTO Drone "Twin". Hegemon Advanced Pilot Precision Award with It-Worked! Vanamonde Utilitarial Commendation (36t) with SP-61 Cargomaster. Jhawk1099 Utilitarial Commendation, Advanced Pilot Precision Award 1st Class with Tiburón mk1. Kneves Utilitarial Commendation (40.520t), Advanced Pilot Precision Award with Bessy. AeroGav Astrokerbal Distinction, Advanced Pilot Precision Award with Astrojet Citation. 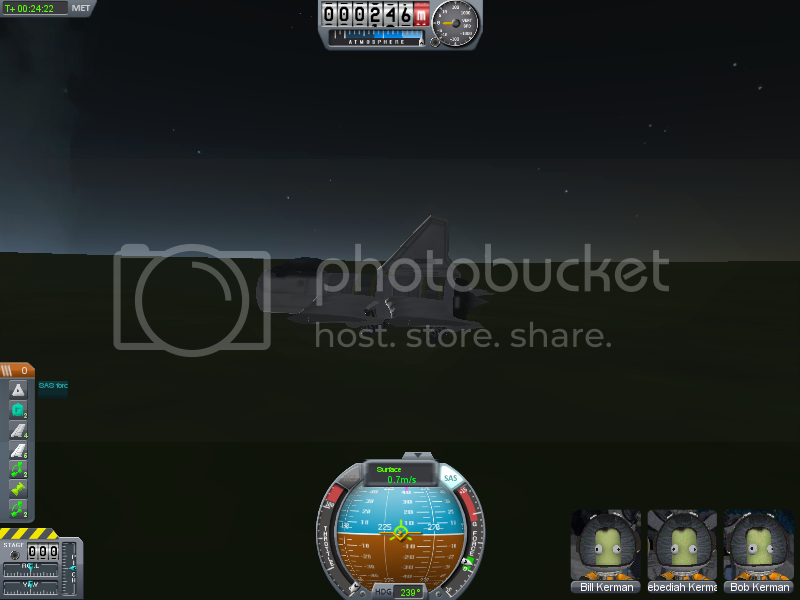 Derpiderp Astrokerbal Distinction with Karpfenator MKII. g00bd0g Utilitarial Commendation (72t), Advanced Pilot Precision Award with Stock MK3 Space Plane. - Astrokerbal Distinction (Minmus & Mün), Advanced Pilot Precision Award with MK2 SSTO SpacePlane. DustInTheWind Advanced Pilot Precision Award 1st Class with SSTO CTV MkVII "Gus Bus". - Utilitarial Commendation, Advanced Pilot Precision Award with Archer. Kroshan Utilitarial Commendation (72t), Advanced Pilot Precision Award with The Orange Clockwork. SpaceplaneAddict Utilitarial Commendation with Executable. Firemetal Pilot Proficiency Medal with The Space Bird. Thalamask Advanced Pilot Precision Award with Silver Dart (v1.05). ChaoticPheonix Advanced Pilot Precision Award with Flechette. JacobJHC Astrokerbal Distinction (Minmus) with Stock Minmus SSTO. 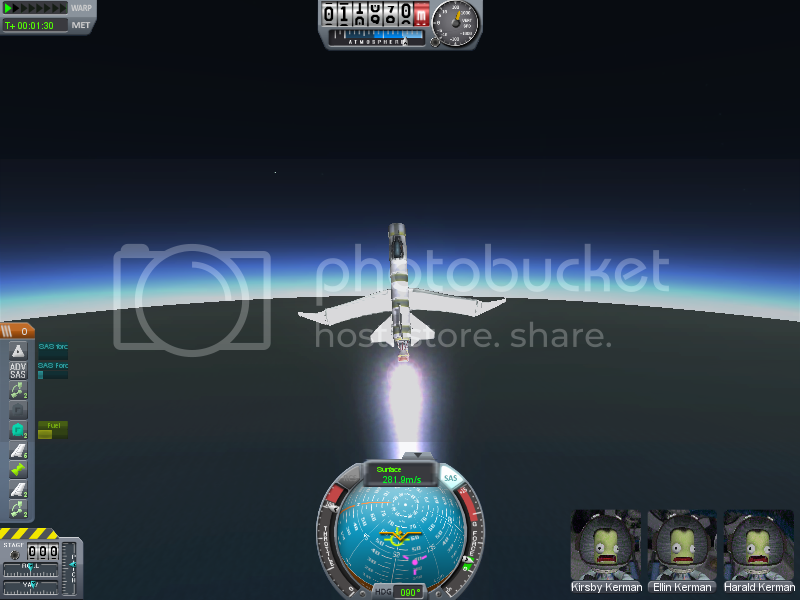 - Exploratory Astrokerbal Distinction (Gilly) with Gilly SSTO (ion). - Exploratory Astrokerbal Distinction (Ike) with Ike SSTO (nuclear). - Astrokerbal Distinction (Minmus) with Minmus SSTO (nuclear). Kryten 2X4B 523P Advanced Pilot Precision Award 1st Class with Slingshot Mk1 SSTO. something Advanced Pilot Precision Award 1st Class with Mjölnir. SuicidalInsanity with Tower of Babel. Maximalist record holder v1.1 (1269.85 t) . Empress Neptune Utilitarial Commendation (85t), Advanced Pilot Precision Award with S-840. Kergarin Advanced Pilot Precision Award 1st Class with the Stearwing A300 (undercover) SSTO (video). Mycroft Advanced Pilot Precision Award with the Shooting Star. kepicness Expeditionary Utilitarial Distinction (Duna), Advanced Pilot Precision Award with the NISP XII. Samniss Arandeen Advanced Pilot Precision Award with Project Archer. agent 902 Advanced Pilot Precision Award with Gustav Vasa 1. Brikoleur Utilitarial Commendation, Advanced Pilot Precision Award with Archangel 1CL. *Major Tom* Utilitarial Commendation, Advanced Pilot Precision Award with Progressor-Heavy-mk1. Magzimum Advanced Pilot Precision Award 1st Class with SpacePlane Mk3. valens Utilitarial Commendation, Advanced Pilot Precision Award with STS-2 "Dark Forest". Aegolius13 Expeditionary Astrokerbal Distinction (Laythe), Advanced Pilot Precision Award with Tern. Sean Mirrsen Advanced Pilot Precision Award with Space Harrier 3.0. RCGothic Advanced Pilot Precision Award with Perfect. Lothsahn Utilitarial Commendation, Advanced Pilot Precision Award with Loth SSTO 200 II. Just Jim Advanced Pilot Precision Award with She. Hotaru Advanced Pilot Precision Award with SSTO 105 Mark I.
rudi1291 Utilitarial Commendation, Advanced Pilot Precision Award 1st Class with SSTO 105.
g00bd0g Utilitarial Commendation (36.5t), Advanced Pilot Precision Award 1st Class with Space Goose x8. - Advanced Pilot Precision Award with Le Petit Alpaca V1. 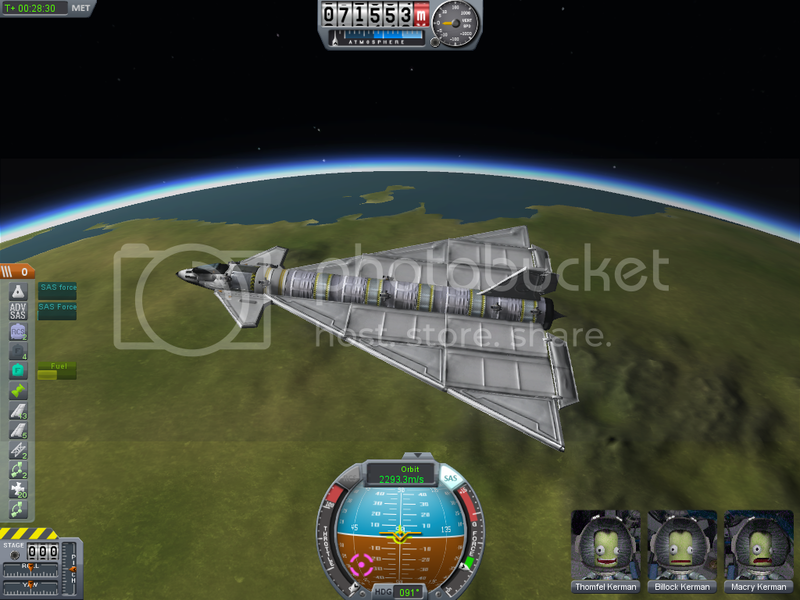 - Advanced Pilot Precision Award with Bill Kermans' SSTO. - Advanced Pilot Precision Award with Snack Delivery SSTO (minimalist record holder 2.140t). parameciumkid Utilitarial Commendation, Advanced Pilot Precision Award with Cargo Spaceplane. iospace Advanced Pilot Precision Award with Fire Rat. 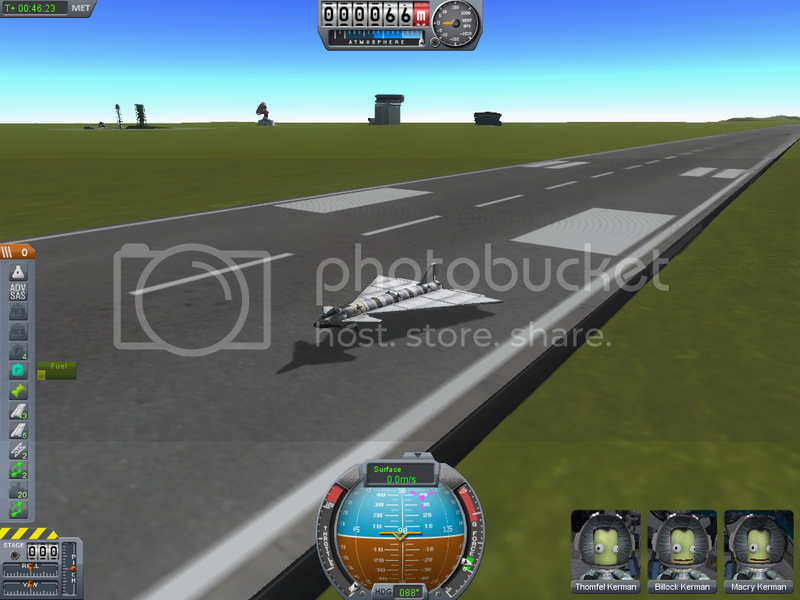 - Advanced Pilot Precision Award with Fire Rat after refuel at KSC. Der Anfang Pilot Proficiency Medal, Kosmokerbal Commendation with Proto Nuclear SSTO I.
ABalazs Advanced Pilot Precision Award with Guppy. Bill Zarr Advanced Pilot Precision Award 1st Class with Peregrine. Gojira1000 Utilitarial Commendation (42t), Pilot Proficiency Medal with Mule-1. - Astrokerbal Distinction (Minmus) with Scooter. madster Advanced Pilot Precision Award 1st Class with Dumb 2.
sieve Advanced Pilot Precision Award with Hubble Service Vessel. Temstar Advanced Pilot Precision Award 1st Class with Starlifter. manni01 Astrokerbal Distinction (Mün), Advanced Pilot Precision Award with Mun SSTO. - Expeditionary Astrokerbal Distinction (Duna), Advanced Pilot Precision Award with SSTO Sunder. ECarinae Advanced Pilot Precision Award with SP-M.
Randazzo Advanced Pilot Precision Award 1st Class with Kestrel III. Doctor Mandarb Advanced Pilot Precision Award with SSTO-MKIII. stewis Utilitarial Commendation (45t), Advanced Pilot Precision Award 1st Class with SSTO 1. - Utilitarial Commendation (110t), Advanced Pilot Precision Award with SSTO2. MagicFireCaster Advanced Pilot Precision Award 1st Class with FRC-P01 Flying Mole. ForScience6686 Advanced Pilot Precision Award with Stingray. RizzoTheRat Utilitarial Commendation (x3 sats), Pilot Proficiency Medal with SSTO3a. TrainEngie Advanced Pilot Precision Award 1st Class with Spearhead-Port SSTO. Edax Advanced Pilot Precision Award with Furiosa IX. PacThePhoenix Astrokerbal Distinction (Minmus), Advanced Pilot Precision Award with Project Omega [K-Prize]. Charwhick Utilitarial Commendation, Advanced Pilot Precision Award with RCSC SSTO Shuttle. Gravaar Astrokerbal Distinction (Minmus) with Mun-n-bak. drewscriver Advanced Pilot Precision Award with Grace Mk1b. BloodStayn Advanced Pilot Precision Award with Butterfly SSTO. Alooohaaa Advanced Pilot Precision Award with SSTO. Amianoob Advanced Pilot Precision Award with medium lift SSTO. 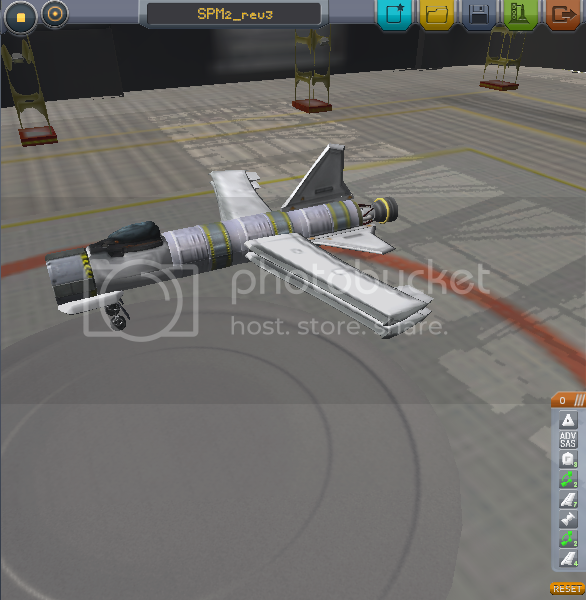 - Advanced Pilot Precision Award with SSTO2. Maximus97 Pilot Proficiency Medal with KaX-97 Mk IV. IncongruousGoat with The Ugly Duckling. Draradech Advanced Pilot Precision Award 1st Class with my entry. PointySideUp Utilitarial Commendation, Advanced Pilot Precision Award with Orbit Adapter4. Hodari Utilitarial Commendation (36t), Advanced Pilot Precision Award with KSS Mk3. n.b.z Astrokerbal Distinction (Minmus), Advanced Pilot Precision Award with MMC-30P. Fellow314 with MIN SSTO a NMJ. HebaruSan Advanced Pilot Precision Award with Thiokol Orbiter 1.1. Caligari Kosmokerbal Commendation with Hayha SSTO. Thalamask Advanced Pilot Precision Award with Silver Dart. Guest Lists from previous versions. K-Prize Gatecrasher's badge by WafflesToo (sig badges). Dr.Moo provided easy listening video evidence at the hearing. Taki117 took the view that using uncertified parts was fun. SeventhArchitect felt modifying certified parts was perfectly safe, not bodged at all. At the inquest it emerged that RocketScientistV's pilot kicked the solar panel "because it looked fragile", which it was. Sputnik's Revenge blatantly declined to add wings. TechniCali felt uncertified air intakes looked much cooler and represented no risk to anyone not on board the craft at lift off. Damaske confessed to using illegal refuelling technology. WafflesToo attempted to convince the panel that unidentifiable explosions are a good sign. Gravaar was on record saying that one day all space planes will be made this way. Fengist refused to confirm or deny whether allegations of prevarication were misinformation. 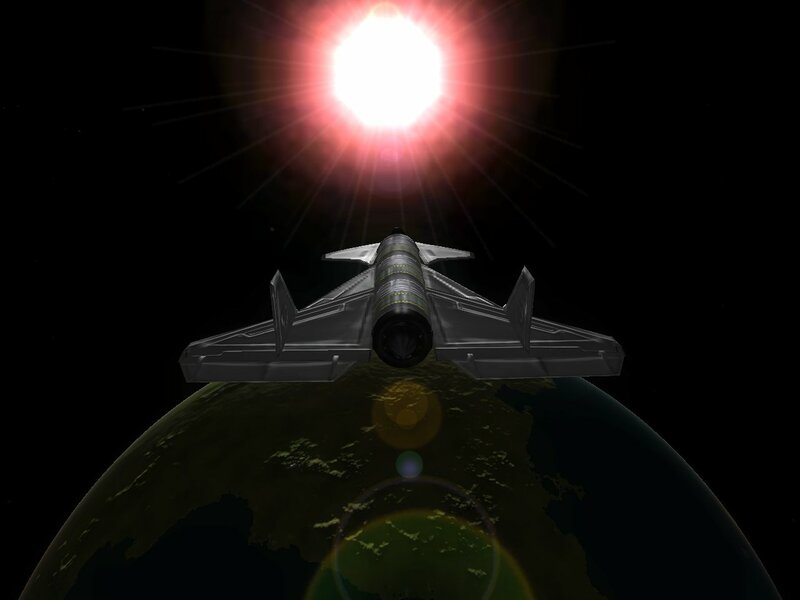 Kokanee quoted in the Kerbin Gazette "I have seen the future and it looks like Firemoth". numerobis reflected that VTOLs dont need to crash the gates, they can just hop over them. GoSlash27 was adamant that that having cake and eating it was entirely possible according to quantum physics. Rakaydos suggested the Kerbal cosmos was a 3 dimensional brane moving in a higher dimensional space and there is no cake. RocketPilot573 told the commission "it was always intended to be an open ended mission". DMSP apologised for a lack of parachutes but felt that the craft had made a special contribution to Kerbin's reef ecology. SkyRex94 philosophised that were the universe a simulation one could adjust the cosmological constant to increase the availablility of sprinkles. Starwhip objected that colliding with the launchpad was unavoidable given the trajectory of the craft. Camaron asserted that the borrowed fuel was neither here nor there after the engines blew up, more kind of everywhere. ExplorerKlatt, found the missing wing tip while looking for lost golf balls. fenya interviewed by Breakfast TV was upbeat saying the craft came tantalisingly close to not crashing on several occasions. Sumguy told judges the detachable wing tip came at no extra charge, offered favourable credit arrangement. Ar180shooter crashing was due to technical issue with failing to not hit the ground. SeanMirrsen admitted that solar power explosions were rare but not unheard of, unlike nuclear engines. Protested Stupeflyer Mk2 was ahead of its time. Edax conceded that the payload engine may have been tested at an opportune moment. Tynrael on reviewing the video evidence agreed launching downwards was not standard procedure for space vehicles. SuicidalInsanity denied using alien technology to construct a craft somewhat larger than your average spaceplane. GraviTykillz felt refuelling was justified because the ship was a gas guzzling hotrod. FlipNascar argued that disposable spaceships were more fun. RCgothic decided the rule book was best thrown out, to save weight. iospace felt reengineering the planet Kerbin to suit a particular space craft was a price worth paying. Temstar insisted that upstaging Elon Musk was not against the K-Prize rules. Kokanee declared the runway to be disruptive technology. ihtoit quoted in kerbin Gazette "trial and error isn't so expensive if you leave insurance claims until after the next launch". Gojira1000 didn't mention the drilling equipment and fuel converter to the K-Prize adjudication panel since it was a minor detail. manni01 was adamant that refueling was essential for returning to Kerbin, supplied video evidence. Didnt read proviso C because it was "just the small print". micr0wave forgot which side the wheels were on, may have lost a wing... or two. n.b.z. 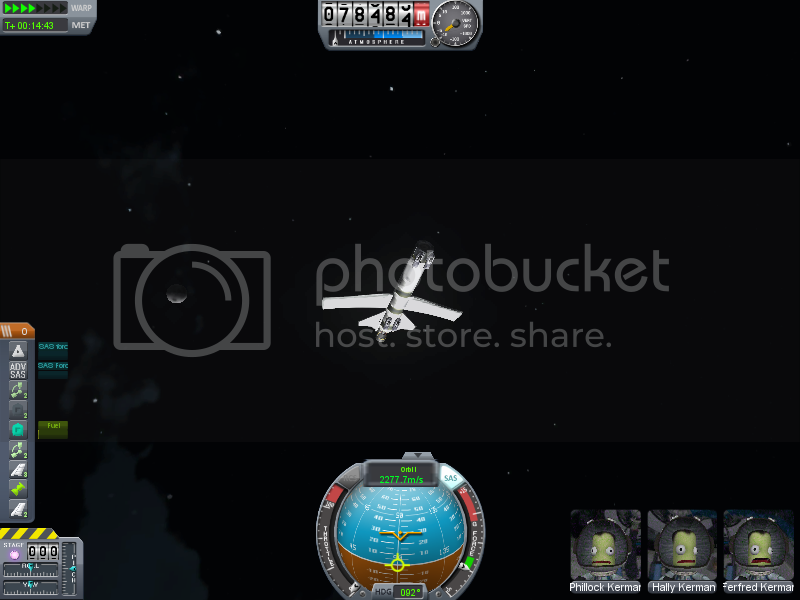 wasnt sure how to get Mirgy and her flying saucer back from Duna but was OK with that. Spartwo beat the odds but lost quite a lot of spaceship. cy4n argued that a spaceplane was a rocket with wings, suggested the K-Prize panel should try not to worry about the "drop tanks". luizopiloto considered the mission a democratic success, since a majority of parts didnt explode on touchdown. 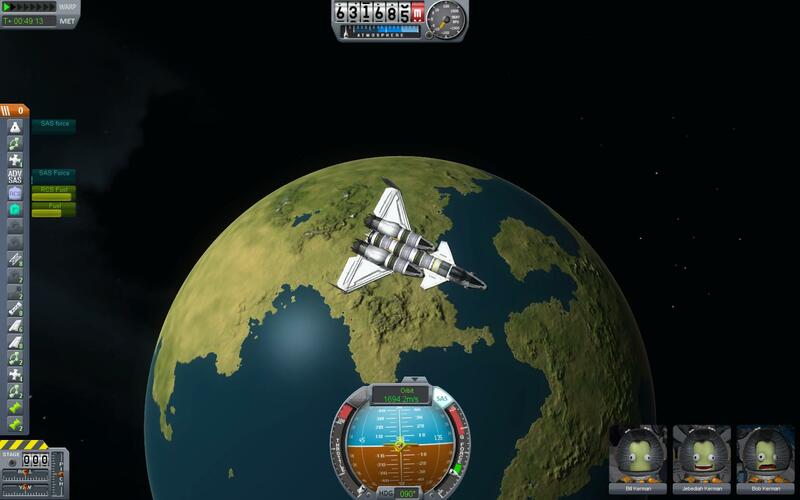 Jebediah Klerman brought a rocket to a spaceplane challenge. Felt rules were biased against vertical take off, which they are. Marschig glossed over refining-refuelling at Laythe, denied being a rulebreaker saying, "the rules were like that when I found them". hoioh suggested there was no such thing as bad publicity. Craft files would be nice by the end of this challenge. 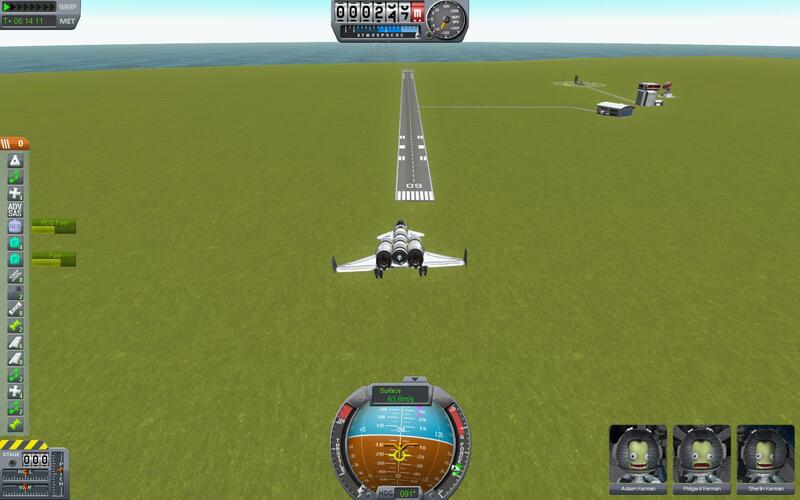 Making space planes is hard! 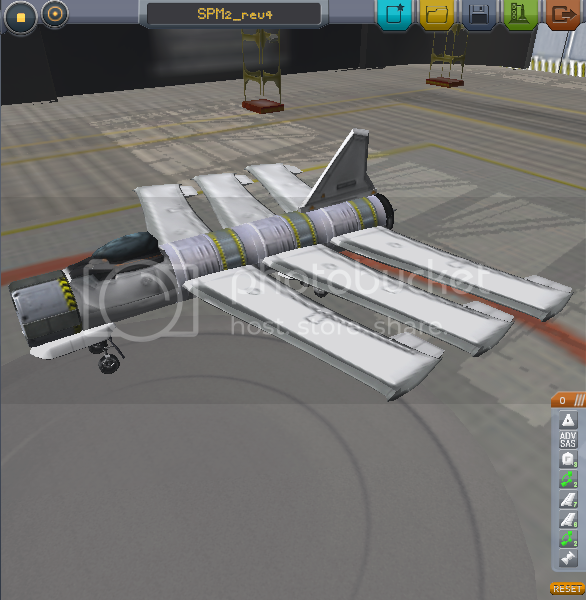 making SSTO space plane is extra hard. One question. Vertical launches are perfectly ok right? Woot! 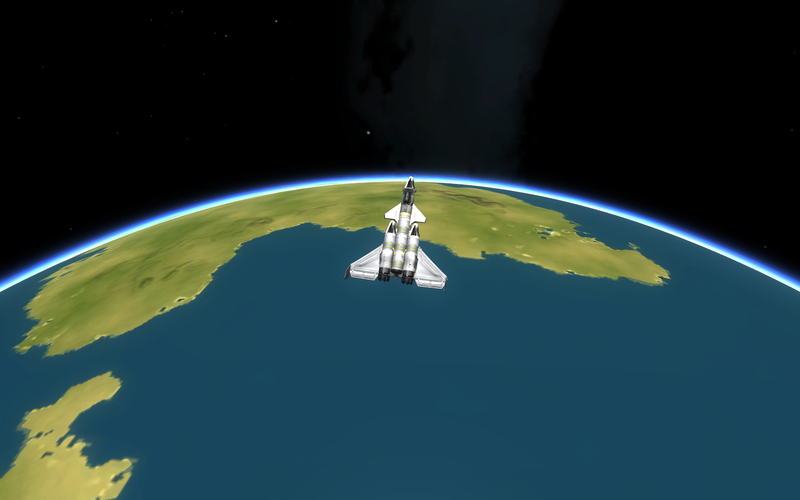 I have an SSTO spaceplane in orbit at 230km, I\'ll land at the KSC and upload the pics, watch this post! 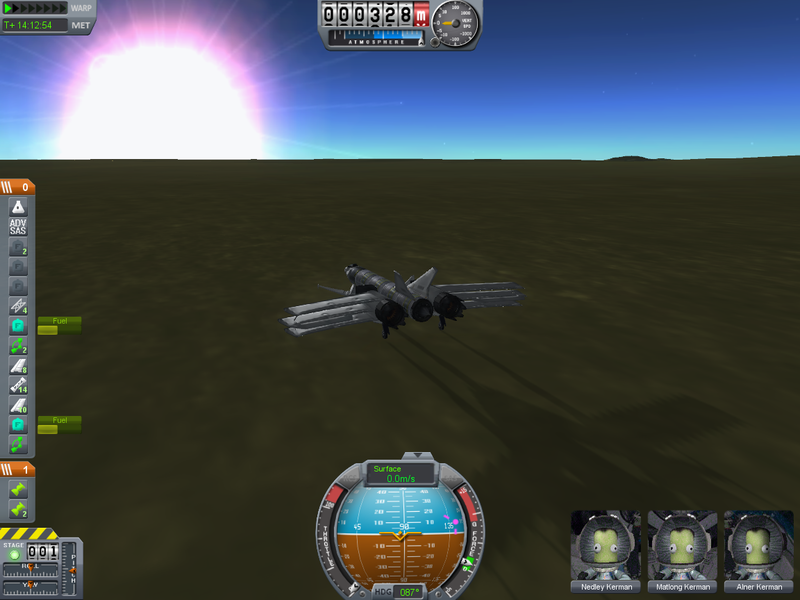 Update: Aircraft failed to return to Kerbin, the weight distribution was such that the engine flew through the airframe and the craft disintegrated, I have another more stable plane but I need to get out in this sun, it\'s been cold for so long here. Edit : adapting the post to carry honour rolls from the previous versions. FYI all links in Version 1.0 and previously are broken because Squad "fixed" the forum. Rune with White Dart 1.0 Prototype. panzer1b with Tri-Fighter V Prototype. Overfloater Advanced Pilot Precision Award with space plane. Jakinbandw Advanced Pilot Precision Award with Speed Demon. YellowApple with Hummingbird Mk.1 - KSP 1.0.0 edition. plotz Advanced Pilot Precision Award with Kerthrop RDP-29. - Kosmokerbal Commendation, Utilitarial Commendation (MÃƒÂ¼n) with Twin Turbo SSTO Planetoid Edition. Merandix Utilitarial Commendation (10.7t), Advanced Pilot Precision Award 1st Class with Sleipnir. Sean Mirrsen Utilitarial Commendation, Advanced Pilot Precision Award with Stratoghoul Mk2. sdj64 Astrokerbal Distinction (Minmus), Advanced Pilot Precision Award with Zanzibar. Kuzzter Advanced Pilot Precision Award with Nooxie 4A. Slugy Utilitarial Commendation, Advanced Pilot Precision Award with Rapier cargo. SuperHappySquid Utilitarial Commendation with SSTO Tiny Cargo. Cybersol Utilitarial Commendation (40t), Advanced Pilot Precision Award 1st Class with Hammer Orange SSTO (178.958t). kahlzun Advanced Pilot Precision Award with Space QM. Kagame with XB-70 Valkyrie SSTO. Tarmenius Utilitarial Commendation, Advanced Pilot Precision Award 1st Class with Jatayu. percyPrune Utilitarial Commendation, Advanced Pilot Precision Award with Hotdog4. Randazzo Advanced Pilot Precision Award 1st Class with Kestrel II. redsh Advanced Pilot Precision Award with mini buzzer orbital. Stochasty Advanced Pilot Precision Award with Upn Atom VI. - Astrokerbal Distinction (Minmus), Advanced Pilot Precision Award with Upn Atom VI. - Astrokerbal Distinction (MÃƒÂ¼n), Advanced Pilot Precision Award with Upn Atom VI. - Astrokerbal Distinction (Duna), Advanced Pilot Precision Award with Upn Atom VI. Terh Utilitarial Commendation, Advanced Pilot Precision Award with SSTO Haron Mk2. LittleBlueGaming Advanced Pilot Precision Award with Pugio Mk 1.
sj176 Advanced Pilot Precision Award with K-Prize SSTO. Starhawk Utilitarial Commendation, Advanced Pilot Precision Award with Space Goose. bb-pio with SR-71 Blackbird SSTO spaceplane. psyberduckling Advanced Pilot Precision Award with Asp Mk1. netbumbler Advanced Pilot Precision Award with Munney Shot. spikes2020 Utilitarial Commendation (>36t), Advanced Pilot Precision Award with SSTO-5 (253.5t). rudi1291 Advanced Pilot Precision Award 1st Class with Tourist Bus. juzeris Expeditionary Astrokerbal Distinction (Laythe), Advanced Pilot Precision Award with Krau 6.
g00bd0g Utilitarial Commendation (51t), Advanced Pilot Precision Award with MK3 SSTO Cargo 1 Bay. Evanitis Advanced Pilot Precision Award with Explosion Free. Batz_10K Advanced Pilot Precision Award with V-Machine. L3v1athan Utilitarial Commendation, Advanced Pilot Precision Award with SpaceplaneShort. selfish_meme Utilitarial Commendation (36.5t), Advanced Pilot Precision Award with SMA OrbitMaster. Fenya Advanced Pilot Precision Award with Finch. ILikeRovers Advanced Pilot Precision Award with Small Liquid SSTO. t3hJimmer Utilitarial Commendation, Advanced Pilot Precision Award with Stearwing XL. Nefrums Expeditionary Astrokerbal Distinction (Laythe, Bop, Pol), Advanced Pilot Precision Award with SSTL. parzr Utilitarial Commendation (90t), Advanced Pilot Precision Award with Gigantor (maximalist record holder 562.37t). GoSlash27 Advanced Pilot Precision Award with Mainway Adobe. drewscriver Utilitarial Commendation (10t), Advanced Pilot Precision Award with Hikaze. Red Iron Crown Expeditionary Astrokerbal Distinction (Laythe), Advanced Pilot Precision Award with SSTLR. Qigon Pilot Proficiency Medal with Zz Tourist Carrier. heavylifter Advanced Pilot Precision Award with Small SSTO 8.
killakrust Advanced Pilot Precision Award with the Wasp. harzard-ish Astrokerbal Distinction (MÃƒÂ¼n), Advanced Pilot Precision Award with stock SSTO. Nich Astrokerbal Distinction (MÃƒÂ¼n), Advanced Pilot Precision Award with SSTM. Yodaskool Advanced Pilot Precision Award with Simple SSTO. Samniss Arandeen Advanced Pilot Precision Award with Fletchinder. boolybooly Advanced Pilot Precision Award with Zoltron D.
astrobond Advanced Pilot Precision Award with Delta-104-SSTO-Big. Veeltch Advanced Pilot Precision Award with Roadrunner MkVI. castille7 Advanced Pilot Precision Award with Space Eagle. Zaddy23 Utilitarial Commendation, Advanced Pilot Precision Award with the ZSA Wallaby. hazard-ish Utilitarial Distinction (Minmus mining base + scansat) Advanced Pilot Precision Award with SSTO Shipment 1. RexKramer Advanced Pilot Precision Award with Tiny SSTO (minimalist record holder 4.3t). TrainEngie Advanced Pilot Precision Award 1st Class with KRS-1. Concentric Advanced Pilot Precision Award 1st Class with Triangle. - Utilitarial Commendation, Advanced Pilot Precision Award with Delta Drone. Dfthu Advanced Pilot Precision Award with Far-Reacher SSTO. kalabaddon Advanced Pilot Precision Award with Pocket Rocket MkI. Haruspex Utilitarial Commendation, Advanced Pilot Precision Award with Minotaur Orbiter. StanK Advanced Pilot Precision Award with One Rocket, One Jet, One Fuel. Przemqo Pilot Proficiency Medal with Kescape. xendelaar Advanced Pilot Precision Award with K-Prize. Scarecrow88 Advanced Pilot Precision Award with Kiter SSTO. severedsolo Utilitarial Commendation, Advanced Pilot Precision Award with I can't believe it made it. EvermoreAlpaca Utilitarial Commendation (100t), Advanced Pilot Precision Award with EvermoreAlpaca Lift 100 Eve Tug Seven. Kokanee Advanced Pilot Precision Award with Adder. Flurburtur Advanced Pilot Precision Award with K919 Interceptor. Kagame Utilitarial Commendation, Advanced Pilot Precision Award with Heterodyne 1. Mikki Kosmokerbal Commendation, Utilitarial Commendation, Advanced Pilot Precision Award with K-Prize. Lothsahn Utilitarial Commendation, Advanced Pilot Precision Award with the Galaxy VII Heavy. - Advanced Pilot Precision Award 1st Class with the Galaxy VII. ChaoticPheonix Advanced Pilot Precision Award with Atlas SSTO. Kokanee Advanced Pilot Precision Award with Perigree. - Utilitarial Commendation, Pilot Proficiency Medal with Ascension. YellowApple Utilitarial Commendation, Advanced Pilot Precision Award with Hummingbird. Starhawk Advanced Pilot Precision Award with Sparrow Mk2. - Astrokerbal Distinction (MÃƒÂ¼n), Advanced Pilot Precision Award 1st Class with Spacehawk Mk2. hoioh Utilitarial Commendation, Advanced Pilot Precision Award with Triple Swallow. Batz_10K Advanced Pilot Precision Award with Turbo Finch LTSP R.
- Advanced Pilot Precision Award with KA-1 Suicide Sled. Signo Advanced Pilot Precision Award with Sunbeam 090. Jonboy Kosmokerbal Commendation (Minmus) with MX-1. GeneralMDBK Advanced Pilot Precision Award with Ant. Agifem Advanced Pilot Precision Award with SpacePlane Mk1. CaptainVlad Utilitarial Commendation, Advanced Pilot Precision Award with RO-1 Torpedo. antihifi Utilitarial Commendation, Advanced Pilot Precision Award with Shuttle MK V HV. - Advanced Pilot Precision Award 1st Class with Microjet RCS-dock. - Advanced Pilot Precision Award 1st Class with Microjet Dock 3. - Utilitarial Commendation, Advanced Pilot Precision Award 1st Class with Corvette R6 Payload. - Utilitarial Distinction (Minmus) & Commendation x4 (+MÃƒÂ¼n), Advanced Pilot Precision Award with Buh Hee Moth (current maximalist record holder at 226.407t). - Advanced Pilot Precision Award with Microjet 2.0. - Expeditionary Utilitarial Distinction (Duna), Kosmokerbal Commendation (Ike), Advanced Pilot Precision Award with SSTO Space Plane. - Utilitarial Commendation x5 (Eve), Advanced Pilot Precision Award with SSTO Space Plane. - Advanced Pilot Precision Award 1st Class with Cargo SSTO. - Utilitarial Commendation (39t), Advanced Pilot Precision Award 1st Class with Cargo SSTO. norup Utilitarial Commendation, Advanced Pilot Precision Award 1st Class with MK3 Skylon SSTO. Merandix Utilitarial Commendation, Advanced Pilot Precision Award with ME-HSP1 Svadilvari. Starwhip Utilitarial Commendation & Distinction (Minmus), Advanced Pilot Precision Award with Starstreaker III. Cupcake... Astrokerbal Distinction x2(MÃƒÂ¼n & Minmus), Advanced Pilot Precision Award with Sprite (videos). - Expeditionary Astrokerbal Distinction (Duna), Advanced Pilot Precision Award with Sprite (video). Valcab33 Utilitarial Commendation, Advanced Pilot Precision Award with Pegasus I.
Monsterlunch Advanced Pilot Precision Award 1st Class with Galadrian I.
Sean Mirrsen Advanced Pilot Precision Award with Stratogale Mk2. - Utilitarial Commendation, Advanced Pilot Precision Award with Stratogale Mk2. Foxster Pilot Proficiency Medal with Bag o Bits. - Pilot Proficiency Medal with Bag o Spanners. - Advanced Pilot Precision Award with Sippy Cup. - Advanced Pilot Precision Award with more tweaking. astrobond Advanced Pilot Precision Award with MicroSSTO. - Utilitarial Commendation (32.2t), Advanced Pilot Precision Award with New Mk3 Shuttle Eloo Biomes Catcher. bdito Advanced Pilot Precision Award with twin rapier delta design. Mesklin Advanced Pilot Precision Award with Brynhildr (current minimalist record holder at 1.708t). raygundan Utilitarial Commendation (36t) and the Advanced Pilot Precision Award with Cormorant. - Expeditionary Astrokerbal Distinction (Laythe), Exploratory (Duna, Pol, Bop) Kosmokerbal Commendation (Minmus), Advanced Pilot Precision Award with Loon. kahlzun Advanced Pilot Precision Award with starscream mk2. WhiteKnuckle Advanced Pilot Precision Award with Nomad SXI (VTOL). Death Engineering Advanced Pilot Precision Award with Just a Space Pane. drewscriver Expeditionary Astrokerbal Distinction, Expeditionary Utilitarial Commendation (Duna) Advanced Pilot Precision Award with Alaflux. panzer1b Expeditionary Astrokerbal Distinction (Laythe), with Tri-Fighter III (special honorific - best starbuck lookalike v0.9). Kelderek Utilitarial Commendation, Advanced Pilot Precision Award with Mk2Dromedary. manni01 Expeditionary Utilitarial Distinction (Laythe 15t) with LC Cruiser III 'Eagle'. Styles2304 Advanced Pilot Precision Award with modified SR-71. Reistlyn Expeditionary Astrokerbal Distinction (Laythe) with Pernach. - Astrokerbal Distinction (MÃƒÂ¼n) with Pernach. Samniss Arandeen Advanced Pilot Precision Award 1st Class with Mockingjay. ExplorerKlatt Utilitarial Commendation, Advanced Pilot Precision Award with Hyperion. Camaron Utilitarial Commendation, Advanced Pilot Precision Award with Terranova V.
boolybooly Advanced Pilot Precision Award 1st Class with Fuelplane. - Advanced Pilot Precision Award with Tiny. - Utilitarial Commendation, Advanced Pilot Precision Award 1st Class with Lofter III. Deutherius Advanced Pilot Precision Award 1stClass, Kosmokerbal Commendation (Minmus) and Utilitarial Commendation x2 (Minmus, KTO) with Garrad Mk1-C.
Pamynx Advanced Pilot Precision Award 1stClass with Icarus. Thrain Utilitarial Commendation, Advanced Pilot Precision Award with X-Wing. Speeding Mullet Astrokerbal Distinction (Minmus & Mun), Utilitarial Commendation (Minmus), Advanced Pilot Precision Award with Dinklestein. mdkendall Advanced Pilot Precision Award with Golf II Orbiter. WolfHealr Advanced Pilot Precision Award with Kultralight. JackDraak Advanced Pilot Precision Award with Firebird. sumrex Advanced Pilot Precision Award with Jabby. Redhaze Utilitarial Commendation, Advanced Pilot Precision Award with Iolani 1A. - Utilitarial Commendation, Pilot Proficiency Medal with Iolani 1A/B. Fenya Expeditionary Utilitarial Distinction (Duna), Advanced Pilot Precision Award with Cargo Plane 17B (M2). Ceq Lysander Utilitarial Commendation, Advanced Pilot Precision Award with The Lead Balloon Project. Prillmeister Utilitarial Commendation, Advanced Pilot Precision Award 1st Class with Seagull (video). Invisifly2 with Speedy Space Skipper MkIII. g00bd0g Utilitarial Commendation, 2x Advanced Pilot Precision Award & 1st Class (x2 launches) with Snoopy. hazard-ish Exploratory Astrokerbal Distinction (Tekto, mod moon of Jool), Advanced Pilot Precision Award with Dart 2.5.2 (video). TrainEngie Advanced Pilot Precision Award with RAMSES 1. Randazzo Advanced Pilot Precision Award 1stClass with Kestrel. ghostbuzzer7 Advanced Pilot Precision Award with K-Prize SSTO. Maelstrom Vortex Kosmokerbal Commendation (MÃƒÂ¼n), Advanced Pilot Precision Award with The Dart. Torquimedes Advanced Pilot Precision Award with Kython K-wing. Roflcopterkklol Kosmokerbal Commendation (MÃƒÂ¼n), Advanced Pilot Precision Award with White Lightning Mk5. FlipNascar multiple x Utilitarial Commendation, Advanced Pilot Precision Award, station building with Fat Boy. carazvan Utilitarial Commendation, Advanced Pilot Precision Award with Flea SSTO Mk.IV. Jean Deaux Advanced Pilot Precision Award (video) with Hornet. Thorium Pilot Proficiency Medal with Simple SSTO. zilfondel Advanced Pilot Precision Award with SSTO B.
djnekkid Advanced Pilot Precision Award with USS Kenterprise. The Flying Pigs Utilitarial Commendation, Pilot Proficiency Medal (video) with Teoman2. manni01 Astrokerbal Distinction (MÃƒÂ¼n, video) with MÃƒÂ¼n SSTO. - Utilitarial Distinction (Laythe 6t) with Ethos. GoSlash27 Advanced Pilot Precision Award 1st Class with Butterfly Mk.1. - Expeditionary Astrokerbal Distinction (Eve), Advanced Pilot Precision Award with KrakBadger 2.5. - Advanced Pilot Precision Award 1st Class (x3) with SX DoubleDipper. 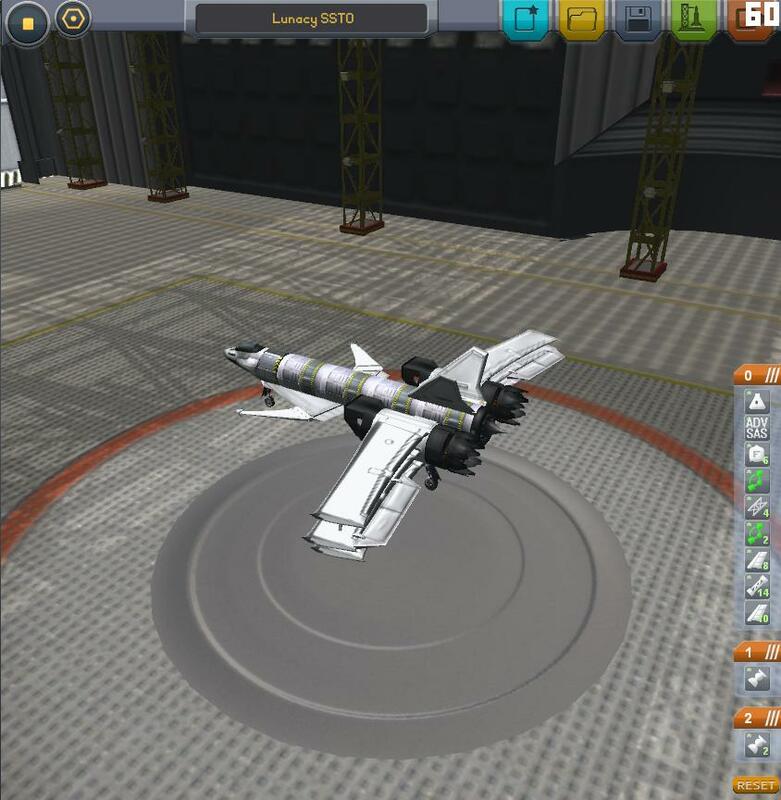 Lou Utilitarial Commendation (Minmus) with Lou's Space Plane. - Utilitarial Distinction (Gilly), includes Utilitarial Commendations (Eve and Gilly) and Astrokerbal Distinction (Gilly) with Runabout. Spartwo Advanced Pilot Precision Award with Kiwi mk2. - Advanced Pilot Precision Award with mk2 hummingbird. Kokanee Utilitarial Commendation, Advanced Pilot Precision Award with Das LuftVogel. Overfloater Expeditionary Utilitarial Distinction (Laythe), Advanced Pilot Precision Award with Astroliner X Saturn. Toxicblue Advanced Pilot Precision Award with Ugly betty. Roflcopterkklol with White lightning mk2. - Kosmokerbal Commendation (MÃƒÂ¼n) with White lightning mk2. Tarmenius Advanced Pilot Precision Award 1st Class with Thresher. AstroDoc Advanced Pilot Precision Award with Rescue. VincentS Astrokerbal Distinction (Minmus), Advanced Pilot Precision Award with a small SSTO. ScriptKitt3h Advanced Pilot Precision Award with Kitt3h Class Luxury SSTO. drewscriver Astrokerbal Distinction (MÃƒÂ¼n), Advanced Pilot Precision Award with Hypatia I. - Astrokerbal Distinction (MÃƒÂ¼n), Advanced Pilot Precision Award with Hypatia II (video). Signo Kosmokerbal Commendation (MÃƒÂ¼n), Advanced Pilot Precision Award with GRIFF Tatanka. astrobond Expeditionary Astrokerbal Distinction (Laythe, video), Advanced Pilot Precision Award with New KLK SSTO 15T. Grumman Advanced Pilot Precision Award 1st Class with the SF-9. The_Rocketeer Utilitarial Commendation, Advanced Pilot Precision Award with Peregrine SP1-C.
Bill Zarr Advanced Pilot Precision Award with Podly-Dynojet. AstroDoc Utilitarial Commendation, Advanced Pilot Precision Award with Mun lander. zawine Advanced Pilot Precision Award with Tweety. bakanando Advanced Pilot Precision Award with Emergency Retrieval Spaceplane Hayato MK1. GloriousWater Advanced Pilot Precision Award 1st Class with Laythe lander. brainlordmesomorph Advanced Pilot Precision Award with GullWing 1. BrainiacBlue Advanced Pilot Precision Award with The Precarious. EdwardKu Advanced Pilot Precision Award with AMX January. Treldon Utilitarial Commendation and Advanced Pilot Precision Award 1st Class with RTV Dragonfly. Starwhip, Utilitarial Distinction (Minmus) Advanced Pilot Precision Award with Starstreaker. Damaske Advanced Pilot Precision Award with Midget beta II. CocoDaPuf Utilitarial Distinction (Minmus) Advanced Pilot Precision Award 1st Class with Space Goose. gm537 Advanced Pilot Precision Award with SSTO VTOL (VTOL). kahlzun Advanced Pilot Precision Award with SPAAAACE!! hoioh Utilitarial Commendation, Advanced Pilot Precision Award with Kerbin Space Elevator MK2. Astrobond Utilitarial Distinction (Minmus) Advanced Pilot Precision Award with Minmus Pocket SSTO MVTOL Stock. WanderingKid Advanced Pilot Precision Award with Sparrow 4a. Luovahulluus Utilitarial Distinction & Astrokerbal Distinction (Minmus), Advanced Pilot Precision Award with Big Moth. - Maximalist record holder (234.6t) BEHEMOTH V.
shufflermuffler Advanced Pilot Precision Award with unnamed big SSTO. Overfloater Expeditionary Astrokerbal Distinction (Laythe & Duna), Advanced Pilot Precision Award with Astro-Cruiser. - Expeditionary Astrokerbal Distinction (Dres, video), Advanced Pilot Precision Award with Astro-Cruiser. - Expeditionary Astrokerbal Distinction (Eeloo, video), Advanced Pilot Precision Award with Astro-Cruiser. Firerunner Advanced Pilot Precision Award with Scarab. Guber K. Utilitarial Commendation, Advanced Pilot Precision Award with K 7. Concentric Utilitarial Commendation, Advanced Pilot Precision Award with Magpie. Norcurion Utilitarial Commendation, Advanced Pilot Precision Award with the Gryphon MK I.
Rhomphaia Astrokerbal Distinction (MÃƒÂ¼n) with Yosuzune. RocketscientistV Utilitarial Commendation, Advanced Pilot Precision Award with the Falcon B. - Advanced Pilot Precision Award with the Manley. Mesklin Minimalist record holder (0.74t), Astrokerbal Distinctions (MÃƒÂ¼n and Minmus), Advanced Pilot Precision Award with Neutrino. - Expeditionary Astrokerbal Distinction (Moho via Eve), Advanced Pilot Precision Award with Arctic Tern. Necrobones Advanced Pilot Precision Award with Spaceplane 02. GoSlash27 Advanced Pilot Precision Award with EVE Express. Gravaar Astrokerbal Distinction (Minmus), Advanced Pilot Precision Award with Spider Mk 16.
cake>pie Utilitarial Commendation, Advanced Pilot Precision Award 1st Class with Kolibri. davidparks21 Kosmokerbal Commendation (Minmus) with SSTO Shuttle. Norcalplanner Advanced Pilot Precision Award 1st Class with Mom's Taxi. GoSlash27 Advanced Pilot Precision Award with the Krakelicious Mk1. percyPrune Advanced Pilot Precision Award with The Prune Flash Harry space taxi. - Advanced Pilot Precision Award with Skylon. boolybooly Advanced Pilot Precision Award 1st Class with Diamondback R.
- Utilitarial Commendation, Advanced Pilot Precision Award with Shuttle 2. The Jedi Master with Fencer Mk.1. RocketPilot573 Utilitarial Distinction (Minmus 15t) Advanced Pilot Precision Award with VelocitorSSTO-HL. kahlzun Advanced Pilot Precision Award with Rapier_Test_Rig. - Advanced Pilot Precision Award with Flood. Dooz Advanced Pilot Precision Award with The (Rapier Free) Hawking. SparTwo Astrokerbal Distinction (MÃƒÂ¼n) with 'don't have a name' Mk1. - Advanced Pilot Precision Award with Sabre (video). NikkyD Advanced Pilot Precision Award with x-glider v1. Overfloater Astrokerbal Distinction (Minmus), Advanced Pilot Precision Award with Space Plane Mk1. - Expeditionary Astrokerbal Distinction (Laythe, Duna), Advanced Pilot Precision Award with Astroliner IV Comet. - Astrokerbal Distinction (MÃƒÂ¼n), Advanced Pilot Precision Award with Spaceplane MkII. - Expeditionary Utilitarial Distinction (Laythe 20t), Advanced Pilot Precision Award with Mega Comet (video). - Expeditionary Astrokerbal Distinction (Laythe), Advanced Pilot Precision Award 1stClass with Astroliner. - Expeditionary Utilitarial Distinction (24t Laythe), Advanced Pilot Precision Award with Astroliner VII "Andromeda". - Expeditionary Utilitarial Distinction (20t Laythe), Advanced Pilot Precision Award with Plane. PatchouliKnowledge Advanced Pilot Precision Award with CrowTengu. sploden current minimalist record holder (1.136t) Advanced Pilot Precision Award with Minisistilikio 3. Redshift OTF Advanced Pilot Precision Award with Cormorant XI. immelman Expeditionary Astrokerbal Distinction (Duna), Advanced Pilot Precision Award with Big Silly Bird 2. 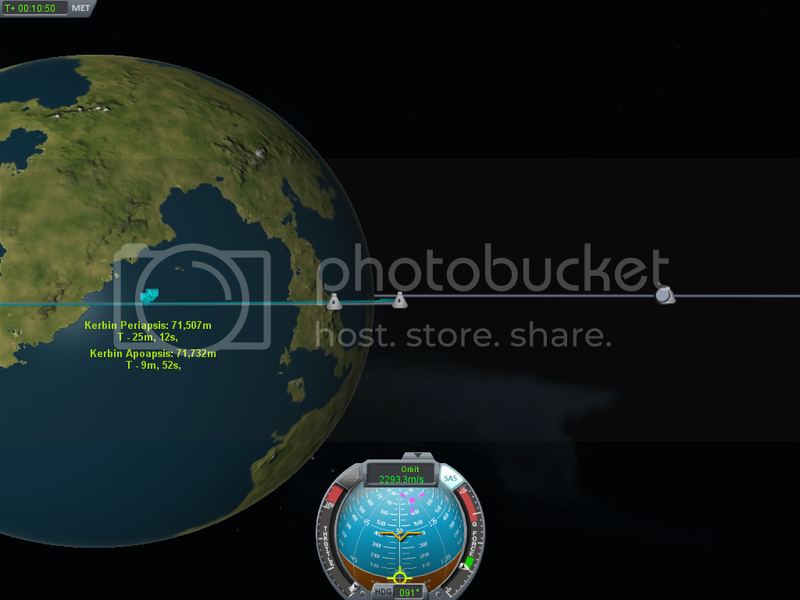 - Expeditionary Astrokerbal Distinction (Laythe), Advanced Pilot Precision Award with Big Silly Bird 3. Broman Utilitarial Commendation with Cargo SSTO MkI. Mesklin Astrokerbal Distinction (MÃƒÂ¼n), Advanced Pilot Precision Award with Mun Goblin. - Expeditionary Astrokerbal Distinction (Laythe), Advanced Pilot Precision Award with Blossom bat. jmiki8 Advanced Pilot Precision Award with Puli Micron. - Utilitarial Commendation, Advanced Pilot Precision Award with Puli SAT. - Astrokerbal Distinction (Minmus), Advanced Pilot Precision Award with Atomic. irongut Advanced Pilot Precision Award with Stiletto 1a. numerobis Advanced Pilot Precision Award with Laytheill. Sniper-Worms Kosmokerbal Commendation (MÃƒÂ¼n & Minmus), Advanced Pilot Precision Award with Cydonia. capi3101 Kosmokerbal Commendation (MÃƒÂ¼n), Advanced Pilot Precision Award 1stClass with the Auk-IV. Romphaia Advanced Pilot Precision Award 1stClass with Siskin. - Astrokerbal Distinction (Minmus) with Phoenixhammer MK1-N.
Tarmenius Advanced Pilot Precision Award 1stClass with the Distesa (SSTO-R 3). Naluski Advanced Pilot Precision Award 1stClass with Supafly-1. Fellow314 Utilitarial Commendation (32t Mun), Advanced Pilot Precision Award with Cargo Twelve i. - Expeditionary Astrokerbal Distinction (Duna) with LR2 v NMJ. Rodyle Advanced Pilot Precision Award 1stClass with Space Plane 1. - Advanced Pilot Precision Award with Space Plane 3. - Expeditionary Utilitarial Commendation (Duna) with the Eagleray Carrier. Rune Utilitarial Commendation (station parts x6 liftoffs with refuel), Advanced Pilot Precision Award 1stClass with Broadsword. RogueMason Advanced Pilot Precision Award with Adder Mk1 (not a Cobra MkIII). Damaske Advanced Pilot Precision Award with Midget Beta 1. LordFjord Utilitarial Commendation (ship parts 2x launch with refuel), Advanced Pilot Precision Award 1stClass with Wasp Mk5. that1guy Utilitarial Commendation, Advanced Pilot Precision Award 1stClass with Hellion III. zeppelinmage Utilitarial Commendation (2 sats), Advanced Pilot Precision Award, Pilot Proficiency Medal with Earl of Sandwich. Kasuha Expeditionary Astrokerbal Distinction (Duna) with the reversible craft Kaeris. - Expeditionary Astrokerbal Distinction (Laythe), Advanced Pilot Precision Award with Kaeris. ABalazs Advanced Pilot Precision Award with X-901-AR. airbus_sai Advanced Pilot Precision Award 1stClass with SSTO Jet Mk1. bsalis Advanced Pilot Precision Award with Excalibur (VTOL capable). Sensi Pilot Proficiency Medal with Reinbacker. RebelFreedom Advanced Pilot Precision Award with ThunderCougarFalconBird (VTOL capable). Sgt. Cookie with Dawns Flower. Cerberus738 Advanced Pilot Precision Award 1stClass with Pelican Mk II. FCISuperGuy Advanced Pilot Precision Award with the KSV Phoenix. - Kosmokerbal Commendation (MÃƒÂ¼n) with revamped KSV Phoenix. Naten Advanced Pilot Precision Award with the Aquarius-C.
Hejnfelt Advanced Pilot Precision Award with WASP SSTO (hotseat 2.1t). PUNiSH3R Advanced Pilot Precision Award with Fallingleaf. Mecha Pants Utilitarial Commendation (x2, station 11.2t), Advanced Pilot Precision Award 1st class with Arrow V Cargo SSTO. Redwizard000 with Space Moth MK I.
noname 117 Advanced Pilot Precision Award with Caracara SSTO. godefroi Advanced Pilot Precision Award with K-Prize Spaceplane. SpaceK531 Advanced Pilot Precision Award with Lumbering Beast. - Utilitarial Commendation, Advanced Pilot Precision Award with Delivery Plane. gchristopher Advanced Pilot Precision Award 1st class with Hot Dog Bun. SeanMirrsen Advanced Pilot Precision Award with the Pretty Fly 2.1.
oarum Advanced Pilot Precision Award with the double bi-plane. Kokanee Advanced Pilot Precision Award 1st class with the Spirit of Collective Socialism. - Utilitarial Commendation, Advanced Pilot Precision Award 1st class with General Kuznetsov Class Cargo Drone. sdj64 Expeditionary Utilitarial Distinction (Duna 24.15t), Advanced Pilot Precision Award with Nidhogg. cheeseit Advanced Pilot Precision Award with Small SSTO. - Kosmokerbal Commendation, Utilitarial Commendation (MÃƒÂ¼n), Advanced Pilot Precision Award with Donut. Landge Kosmokerbal Commendation, Utilitarial Commendation (Minmus), Advanced Pilot Precision Award with SSTO VindiGator Mk 0.23.5. Dr Moo Astrokerbal Distinction, Utilitarial Distinction (Minmus video), Advanced Pilot Precision Award with Condor EX-VIII Experimental SSTO. Remkeau Utilitarial Commendation (36t), Advanced Pilot Precision Award with Phendrana 6-D.
hebdomad Advanced Pilot Precision Award with Ve Gemini (video). Luovahulluus Kosmokerbal Commendation (MÃƒÂ¼n, Minmus) with unnamed SSTO. Laie Advanced Pilot Precision Award with Laythe Lab. Box of Stardust Astrokerbal Distinction (Minmus), Advanced Pilot Precision Award with Viper (looks like the BSG viper). Pipcard Advanced Pilot Precision Award with Swallow. pa1983 Advanced Pilot Precision Award with HOTOL. Mesklin Advanced Pilot Precision Award with Ikar (dV 8288m/s). - Advanced Pilot Precision Award, Astrokerbal Distinction (Mun>Minmus>Kerbin>Mun>Minmus>Kerbin) with Ikar. - Exploratory Kosmokerbal Commendation (Tylo) with lander drop, Advanced Pilot Precision Award with Dedal. - Advanced Pilot Precision Award (x2) with Arrowhead SSTO. pinolallo Advanced Pilot Precision Award, Astrokerbal Distinction (Mun) with FatNose "space jar". - Advanced Pilot Precision Award, Astrokerbal Distinction (Mun + Minmus) with FatNose "space jar". Cupcake... Advanced Pilot Precision Award, Expeditionary Astrokerbal Distinction (Duna) with Bulldog SSTO (stylish video). - Jeb dances to Chris Rea, also Exploratory Astrokerbal Distinction (Ike +Minmus +MÃƒÂ¼n), Advanced Pilot Precision Award with Carpathia. that1guy Advanced Pilot Precision Award with Cetus I SSTO (nightflight video). WafflesToo Advanced Pilot Precision Award, Utilitarial Commendation (2 probes) with Fireball-II (rocketplane video). - Pilot Proficiency Medal, Utilitarial Commendation (3 geostationary sats) with Pelican-K.
bombo1 Pilot Proficiency Medal with The Hawk. 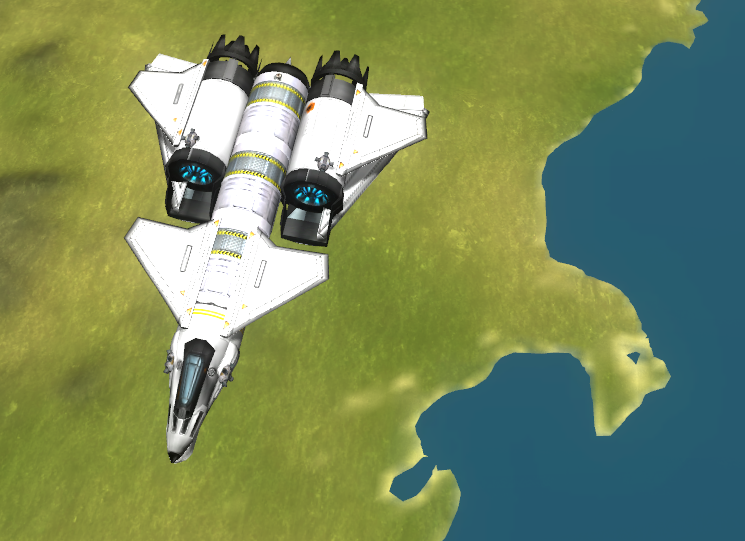 drewscriver Advanced Pilot Precision Award, Utilitarial Commendation (Minmus>36t), current maximalist record holder (125t) v.22 with the wing-swinging Changeling. Plus discretionary "pilot most likely to become a Bond villain award" v.22. BigFatStupidHead Pilot Proficiency Medal with Stiletto -d.
Col_Jessep Advanced Pilot Precision Award, Kosmokerbal Commendation (Mun) with Ivory Hawk. - Advanced Pilot Precision Award with Ladybird. Sirine Advanced Pilot Precision Award with Albatross. that1guy Kosmokerbal Commendation (MÃƒÂ¼n) with Pices 1 SSTO (video). barrenwaste with Untitled Space Craft. El wonso Advanced Pilot Precision Award, Utilitarial Commendation (2 probes), Kosmokerbal Commendation (MÃƒÂ¼n) with SSTO X1 Probe++. - Advanced Pilot Precision Award 1st Class, Utilitarial Commendation (2 probes), Kosmokerbal Commendation (MÃƒÂ¼n) with SSTO X1 Probe++. 11Bravo49417 Advanced Pilot Precision Award with Lame X.
immelman Advanced Pilot Precision Award, Astrokerbal Distinction (Minmus) with unnamed craft. Cinocal Advanced Pilot Precision Award with Delta G2. Tarmenius Advanced Pilot Precision Award 1st Class, Astrokerbal Distinction (Minmus) with La Folie. g00bd0g Advanced Pilot Precision Award, Astrokerbal Distinction (MÃƒÂ¼n) with spunky nuke. winginson Advanced Pilot Precision Award with Valkyrja-C.
Ravenchant Advanced Pilot Precision Award 1st Class with the Sokol. GraviTykillz Advanced Pilot Precision Award with the Bat. xtremespino Advanced Pilot Precision Award 1st Class with NightOwl (video). - Advanced Pilot Precision Award with Sparrow (video). annikk.exe Advanced Pilot Precision Award with SSTO (3.22t). Spartwo Advanced Pilot Precision Award with Arrow. bsalis Advanced Pilot Precision Award, Expeditionary Astrokerbal Distinction (Duna) with Boxkite. leafty Advanced Pilot Precision Award 1st Class with Aeris 4A - Aerospike Edition. Rosarium Advanced Pilot Precision Award with Spirito ASAAA. that1guy Advanced Pilot Precision Award 1st Class with Pisces IV. Mecha Pants with Dodo SSTO. British_Rover Utilitarial Commendation (satellite), Advanced Pilot Precision Award 1st Class with R&R Launcher. Sean Mirrsen Advanced Pilot Precision Award with The Padmasana. boolybooly Advanced Pilot Precision Award with Tern II. - Astrokerbal Distinction (MÃƒÂ¼n), Advanced Pilot Precision Award with Long Ranger III. - Astrokerbal Distinction (Minmus), Advanced Pilot Precision Award with Long Ranger II. - Advanced Pilot Precision Award with Milligan Jet. - Advanced Pilot Precision Award with Deuce. - Advanced Pilot Precision Award (x4) with Milligan Jet K-Prize. ayhc with Trefoil Mk2 KP01. carazvan Advanced Pilot Precision Award, Astrokerbal Distinction (MÃƒÂ¼n) withAnt SSTO. - Advanced Pilot Precision Award, Astrokerbal Distinction (Minmus) with Ant SSTO. - Utilitarial Commendation (5t), Advanced Pilot Precision Award with Bee pSSTO. kushi Advanced Pilot Precision Award (x2) with Aoife H-10 DLKO. Pirke Advanced Pilot Precision Award, Astrokerbal Distinction (MÃƒÂ¼n) withthe Shotgun Hawk. tavert Advanced Pilot Precision Award with MinK 1a. Rosarium (220.01t) Advanced Pilot Precision Award, Utilitarial Commendation (72t) with Immane. Analog Addict (video) Advanced Pilot Precision Award (x3) with SP v4o stock. Stochasty Advanced Pilot Precision Award, current maximalist record holder (258t) with Eve Plane. - +gallery of Expeditionary Astrokerbal Distinctions to Duna, Dres, Laythe & Vall, Eeloo with Vethrfolnir. 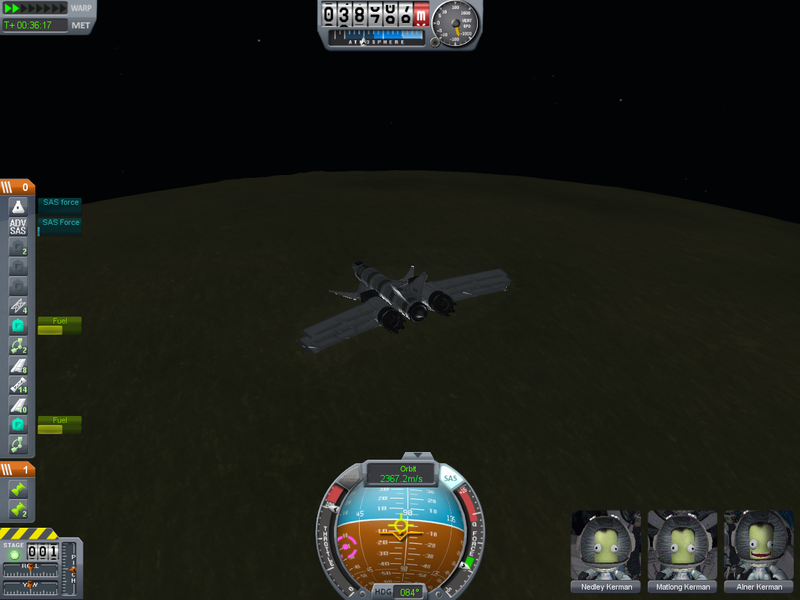 - Expeditionary Astrokerbal Distinction (Eeloo) with Eve Plane. - Advanced Pilot Precision Award, Expeditionary Astrokerbal Distinction (Moho) with Vethrfolnir III. pa1983 Expeditionary Utilitarial Distinction (18.9t Duna), Advanced Pilot Precision Award withFalcon XIII Galaxy STOL. - Expeditionary Utilitarial Distinction (36t Duna), Advanced Pilot Precision Award withFalcon XIIIB Galaxy STOL (video). - Expeditionary Utilitarial Distinction (22.76t Laythe), Advanced Pilot Precision Award with *Falcon XIIIC Galaxy STOL (video). - Utilitarial Commendation (9t) with Falcon XIV Kosmos (video). - Historical archive video Falcon IV Transport (Utilitarial Commendation, Advanced Pilot Precision Award). Tarmenius Advanced Pilot Precision Award with SSTO 4 Resparcia. jaws909 Advanced Pilot Precision Award with the A-15 Skyshark. drewscriver Advanced Pilot Precision Award with Chalice Mk4. - Utilitarial Commendation (20.59t), Advanced Pilot Precision Award with Chalice Mk4r. - Advanced Pilot Precision Award, Astrokerbal Distinction (Minmus) with Dragonshy. ThePseudoMonkey Utilitarial Commendation (18t), Advanced Pilot Precision Award with Iron Buzzard. Crowella Utilitarial Commendation (4.5t), Advanced Pilot Precision Award 1st class with CISPA Expedition Carrier. KarmaComa Advanced Pilot Precision Award with The Styx. BeTa77 Advanced Pilot Precision Award with Featherweight. Poppins Advanced Pilot Precision Award with Wolfbullet. bombo1 with Passenger Shuttle ssto. Cupcake (video) Astrokerbal Distinction (Minmus), Advanced Pilot Precision Award with Scythe Mk2. - Astrokerbal Distinction (Minmus, MÃƒÂ¼n) with Magpie. sploden current minimalist record holder (1.14t), Advanced Pilot Precision Award with Minisistilikio. zekes Advanced Pilot Precision Award with ZoPL Debulist. - Advanced Pilot Precision Award with ZoPL Pip Mk I.
Hejnfelt Advanced Pilot Precision Award with AirWalker. RogueMason Kosmokerbal Commendation (MÃƒÂ¼n) with Space Soarer 1. - Advanced Pilot Precision Award with Hyper Dart. - Astrokerbal Distinction (Minmus with MÃƒÂ¼n flyby) Cosmic Flyer. Pinolallo Advanced Pilot Precision Award 1st class with lightSSTO (x2 runs). - Advanced Pilot Precision Award 1st class with FatNose "Rondine" (amphibious). Moar Boosters Expeditionary Astrokerbal Distinction (Duna, Gilly, MÃƒÂ¼n) with DunaVentura B1. British_Rover Advanced Pilot Precision Award with Blackbird_MOD. Gravaar Kosmokerbal Commendation (MÃƒÂ¼n) with Spider MkV. Scarecrow88 Advanced Pilot Precision Award with Diablo. WafflesToo Advanced Pilot Precision Award with VeryTinyPlane (video). Troma3D Utilitarial Commendation (2.53t) and Advanced Pilot Precision Award with a mystery space plane. ATuinhek Astrokerbal Distinction (MÃƒÂ¼n) with 3-man SSTO. - Advanced Pilot Precision Award, Kosmokerbal Commendation (MÃƒÂ¼n) with Scout SSTO. bsalis Advanced Pilot Precision Award with Explorer. Landge Advanced Pilot Precision Award 1st class with VindiGator. Link to guest lists for versions 0.16 - 0.20. Maxed Rockets, didnt want to come back anyway. evilC, denied accusations of short measures saying "I found it like that." Climberfx parts did not conform with KU common market standards policy. pinolallo, confessed to using experimental technology. Quoted in Kerbin Gazette, "gate crashing is kind of a hobby for me, my FatBob modified lifter for example." Presented "Theory of STOL Craft Design" to the press, available at all good book stores. Publicised secret crew shuttle test flight. 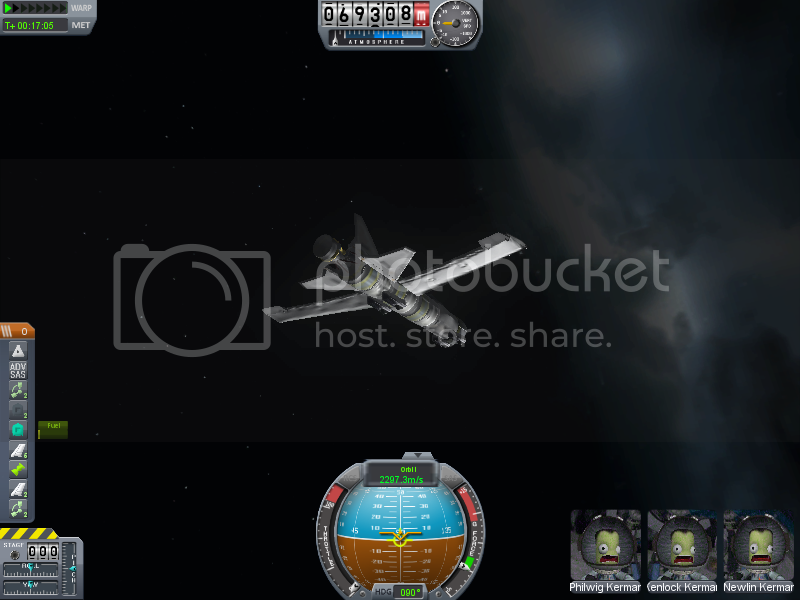 cpt_nosh accidental fuel pump activation was accident. Kappa73, on returning from Laythe told reporters that mid-flight ship disintegration is perfectly normal, nothing to worry about. Complained about Kerman Bros plumbing. Psycho529 prefers the Mun to Kerbin anyway. Lazer Cut landed on the wrong planet, claimed it was deliberate. 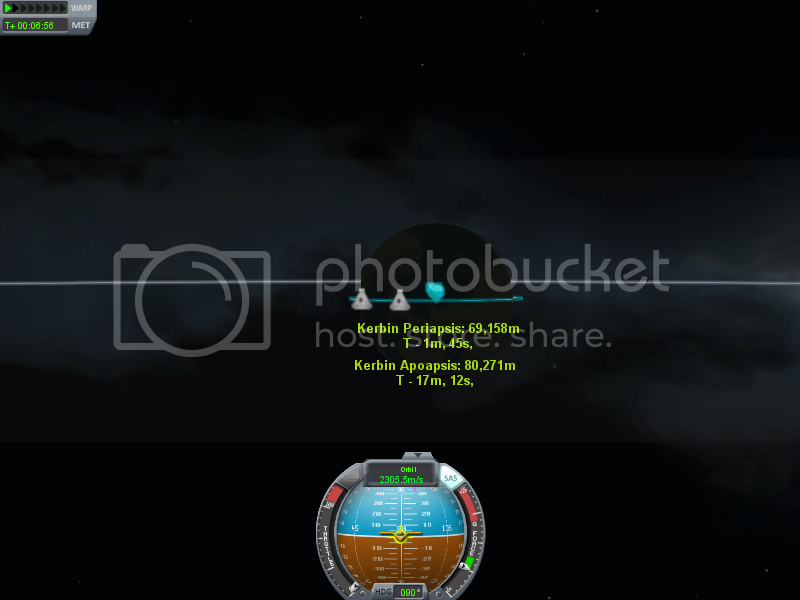 PotatoOverdose made no secret of refuelling on Laythe... many times over. japa what goes up doesnt always come down. Cupcake opined that gentlemen prefer VTOL, supplied some most funkadelic demonstration videos. Auriga exploring the universe in a Spaceballs Camper Van (video). - claimed "the force made me do it!" (Xwing video) (TIE fighter). Technical Ben told all who would listen "Kraken is more than a mere rocket!" supplied promotional video at no extra charge! VincentS having some technical difficulties with the "not crashing" bit. Claimed losing a fuel tank on Duna was no accident. WafflesToo blatantly attempted to distract the K-Prize judges with a one act play (and video). Spartwo admitted creative interpretation of altimeter readings. Made persistent attempts to distract the bouncers. Cinocal likes to swing baby yeah (wings that is) ! - felt that altering Kerbin's atmosphere was a price worth paying. zekes insisted that shuttles are spaceships too. 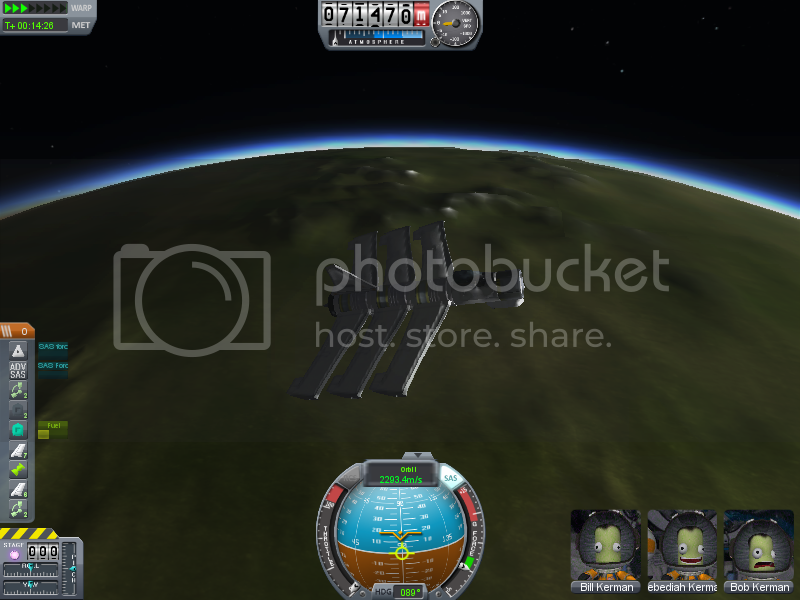 Rhomphaia took the view that any landing Jebediah could walk away from was a good landing. El wonso quoted in Kerbin Gazette "In fact you can change the laws of physics." British_Rover said distributed landing technique was experimental. I'm a watchin' sal_vager, I'm a watchin'. I welcome your enthusiasm hebdomad. Did you see rule #2? Gets to at least 70km, all one piece, 2 stages, enough RCS fuel for orbital maneuvering, and enough jet fuel to do a controlled landing. All 0.15 vanilla parts. Looks like my glorified rocket approach is... iffy. When the rocket fuel tanks finally get separated from jet fuel ones (0.16 i think), I\'m sure this challenge would be much more challenging. The Rocket fuel tanks simply carry so much more for their weight. First, though, I need to build something that can rendezvous with my stranded spaceplane and nudge it back into the atmosphere. You have no idea how much I have tried to do that. Try and try, space is huge. I still haven\'t had a plane or ship that can do that. With the current state of attachment, impossible. If I had access to vertical launches and detachment, it would be done in a min. Kuris Advanced Pilot Precision Award with an unnamed small and agile spaceplane. meyst Advanced Peoples Pilot Precision Award 1st Class with glorious Yggdrasil. zekes Kosmokerbal Commendation with ZoPL Endeavour. - Exploratory Kosmokerbal Commendation (Duna) with ZoPL Kiwi. pa1983 Expeditionary Utilitarial Distinction (45T to Duna) with Falcon XC Jumbo Transport (213.64). - Utilitarial Commendation (72.92t), Advanced Pilot Precision Award with Falcon XI Hercules. - Utilitarial Commendation, Advanced Pilot Precision Award with Falcon XI Hercules (video). - * Includes FREE Awesome Construction Video. Tarmenius Advanced Pilot Precision Award with La Paix. heavylifter Advanced Pilot Precision Awards x4 with Sweetmidge, Sweetmite, Fairfly (5.18t) & Bat. CHR1SZ Advanced Pilot Precision Award with HyPerformance. Cal'Mihe Utilitarial Distinction, Advanced Pilot Precision Award with Starspeeder. Jod Advanced Pilot Precision Award 1st Class with KASA Moth IX-C variant. sploden Advanced Pilot Precision Award with The Chair. - Advanced Pilot Precision Award with Hummingbird. - Advanced Pilot Precision Award with The Bumblebee. tavert Advanced Pilot Precision Award with unspecified MinLKO iteration. Tiron Advanced Pilot Precision Award with Ravenspear Mk3-F.
Kappa73 Exploratory Astrokerbal Distinction (Laythe), Advanced Pilot Precision Award with SSTOck. meeki Advanced Pilot Precision Award with meeki-SP-LV45. WafflesToo (video) Utilitarial Commendation and Advanced Pilot Precision Award with Aurora. Cinocal Advanced Pilot Precision Award with Cheyenne Drop Ship w/M577. nerdboy64 Advanced Pilot Precision Award 1st Class with HS-210 Photon. Cranium Advanced Pilot Precision Award with Falcon X2. giggleplex Advanced Pilot Precision Award with VTOLSSTO. bsalis Advanced Pilot Precision Award with Valkyrie. that1guy (video) with Orca XIII. Tarsus (video) Advanced Pilot Precision Award 1st Class with X-13. Tryptophan Pilot Proficiency Medal with The Oracle. kahlzun Advanced Pilot Precision Award, Astrokerbal Distinction (Minmus) with Swoop. - Advanced Pilot Precision Award, Utilitarial Commendation & Distinction (Minmus) with Swoop-Cargo. Maxed Rockets Advanced Pilot Proficiency Award 1st Class, Utilitarial Commendation (36T) with SPO-18A, SPO-28 & SPO-48. pa1983 Expeditionary Utilitarial Distinction (36T to Duna) with Falcon X Jumbo Transport (video). + Advanced Pilot Proficiency Award to island runway with Falcon X Jumbo Transport (video). - Expeditionary Utilitarial Distinction to (43.26T to Duna) with Falcon X Jumbo Transport (video). + Maximalist Record (v0.19) with 210.81T take off weight. - Exploratory Kosmokerbal Commendation with Debulist. admiralducksauce Advanced Pilot Proficiency Award with Hot Dog II. Tarsus Advanced Pilot Proficiency Award 1st Class with X-4. AmpsterMan Advanced Pilot Proficiency Award with Daedelus. Rosarium Astrokerbal Distinction with Nettuno SSTO. SirJodelstein Pilot Proficiency Medal with Space Dragonfly. boolybooly Astrokerbal Distinction, Advanced Pilot Proficiency Award with Gnat. SecondGuessing Advanced Pilot Proficiency Award, Kosmokerbal Commendation with Almalgest I 'Swift'. kahlzun with SSTO Prototype III. Plur303 Astrokerbal Distinction, Advanced Pilot Proficiency Award with Nuke SSTO MK III. JebDynamics Utilitarial Commendation, Advanced Pilot Proficiency Award with Extended Range. pinolallo 2x Advanced Pilot Proficiency Award 1x Pilot Proficiency Medal with 3KPrize (triple mission). 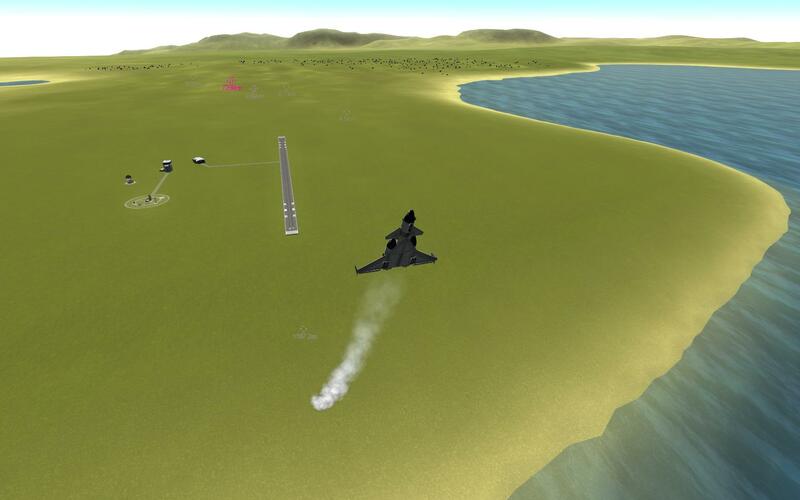 bsalis Advanced Pilot Proficiency Award with VTOL SSTO. BikeKayakSki Advanced Pilot Proficiency Award with Better Glider. Lost in space due to unfortunate rollback incident. 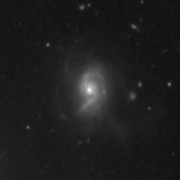 kepicness discovered lost record of NISP 7.1 whitebird. boolybooly, pilot proficiency medal, with Diamondback. ***Astrokerbal Distinction*** with 'Moon Wing'. Return from Ike landing with 'MoonWing XL'. Gossy, *Advanced Pilot Precision Award* with 'Falcon 3'. Archangel Lucifer, *Advanced Pilot Precision Award*, with 'Widowmaker'. with 'Space Wing'. And ***Astrokerbal Distinction*** with 'Hellfire'. sloth, *Advanced Pilot Precision Award* with 'Daedalus K'. bsalis, *Advanced Pilot Precision Award*, with the VTOL capable 'Avenger'. Suzaku, with 'K-17', v17 minimalist record holder with 'XK-17'. kepicness, with 'NISP V.I' nuclear spaceplane. *Advanced Pilot Precision Award*,with 'NISP V.II'. ***Astrokerbal Distinction*** with 'NISP IV'. Klilidiplomus, *Advanced Pilot Precision Award*, with the 'Sky Guardian'. Foursch, *Advanced Pilot Precision Award*, v17 maximalist record holder, with 'Delta Wing IV'. ***Astrokerbal Distinction***, v17 altitudinalist record with 'Vulcan'. 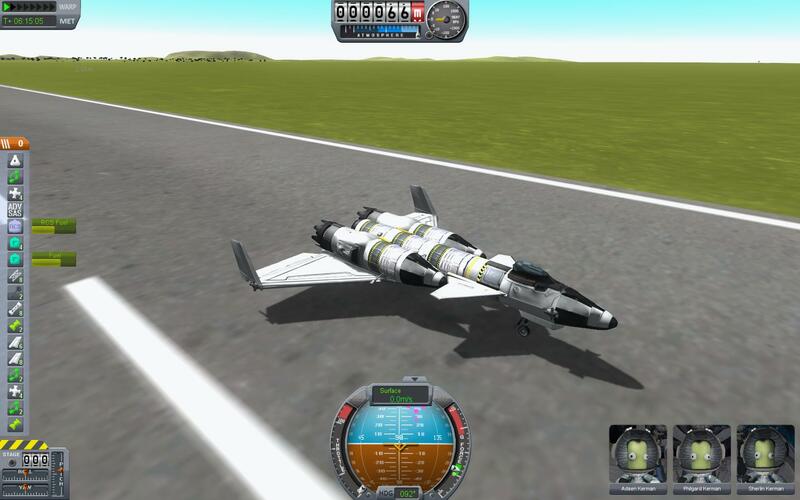 zekes, **Kosmokerbal Commendation** with Zokesia Precision Lifter 4.
souza, with Nexus SSTO 2. Hooligan Labs, Kosmokerbal Commendation with 'Third Time Lucky'. Rogue Mason, with the 'Ceres SSTO Soarer'. zombiphylax, first to succeed, with 'Wespe'. sal_vager gained an *Advanced Pilot Precision Award* with 'Starspark'. Tarmenius, *Advanced Pilot Precision Award*, with a favourite spaceplane. 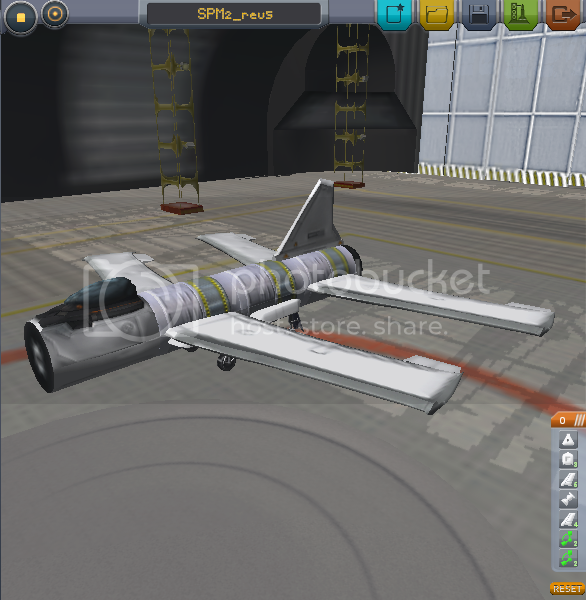 mager42, with 'smini spaceplaneplane', Pilot Proficiency Medal, ***Astrokerbal Distinction*** with 'Skylon3'. UmbralRaptor, with 'SpacePlane_mini' and current Minimalist record holder with Ultramin4D. JellyCubes, *Advanced Pilot Precision Award*, **Kosmokerbal Commendation**, with 'Orbiter'. pushingrobot,*Advanced Pilot Precision Award*, **Kosmokerbal Commendation**, with a commercial spaceliner. All this plus current Maximalist record holder with 'Sawfish'. antbin, *Advanced Pilot Precision Award* by a pinky swear, with the 'KPS delivery van'. ***Astrokerbal Distinction***, with 'SSTmin'. boolybooly, *Advanced Pilot Precision Award* , with the 'Flyingfrog'. hebdomad, *Advanced Pilot Precision Award* , with the 'Jetmaster Aether'. SteevyT, Pilot Proficiency Medal , with a spaceship. 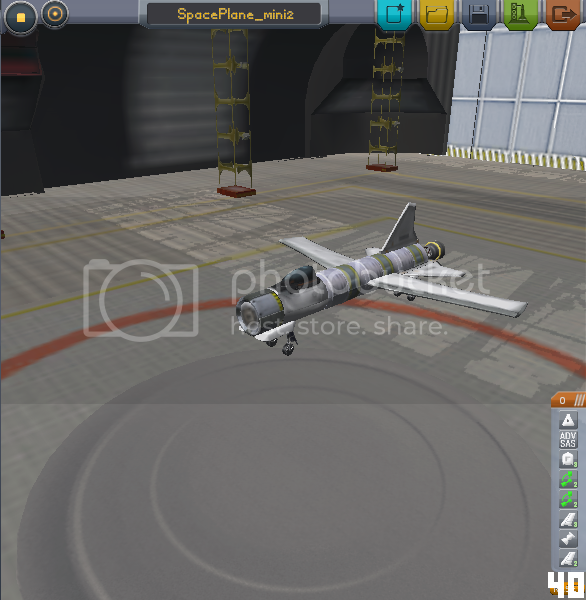 The_Duck, *Advanced Pilot Precision Award* , with 'Reusable Spaceplane 2'. Xeo, Pilot Proficiency Medal, with the 'Vulture'. Parabellum, Pilot Proficiency Medal, with the 'Berkut'. Sean Mirrsen, with the 'Albatruss'. Caldvan, Pilot Proficiency Medal ***Astrokerbal Distinction*** with the 'Kerbin Express'. tjoreilly, with the 'K Prize 5'. Dobrodav, *Advanced Pilot Precision Award*, ***Astrokerbal Distinction*** with 'Bobs XL'. Aerzee, with the 'Joe III Mk4'. illectro, ***Astrokerbal Distinction*** with 'sstm'. geb, ***Astrokerbal Distinction*** with 'Archer Mk2'. G Addict with 'KiG Spaceplane Mk2c'. Also Pilot Proficiency Medal with 'Wobbleboard'. colmo with the 'Kotal SP Stock MkI'. salda007, with Flying Pig-3 (after rescuing the crew). Osterman A, *Advanced Pilot Precision Award* with 'untitled space craft'. khyron42 with 'Ugly Duckling', (after a crash course in aerodynamics). Maxed-Rockets **Kosmokerbal Commendation**, Altitudinalist record holder, *Advanced Pilot Precision Award* with 'Fun1C'. (due to an intervention by the Kerbal Space Safety Standards Authority the fuel related special accomplishment awards are suspended while an inquiry into unsafe fuel mixers is under way). Sean Mirrsen, Pilot Proficiency Medal, with the 'Radiant 2'. CanuckOverlord, with 'Unity Orbital V'. emkej, *Advanced Pilot Precision Award* with 'X-Wing 9000'. martscht, Pilot Proficiency Medal, with 'Buraq 2'. hebdomad, **Kosmokerbal Commendation**, *Advanced Pilot Precision Award* with 'Jetmaster Aether v0.16'. Tarmenius, **Kosmokerbal Commendation**, *Advanced Pilot Precision Award* with the 'Gannet'. Suzaku, *Advanced Pilot Precision Award* with 'K-15 Recordbreaker'. 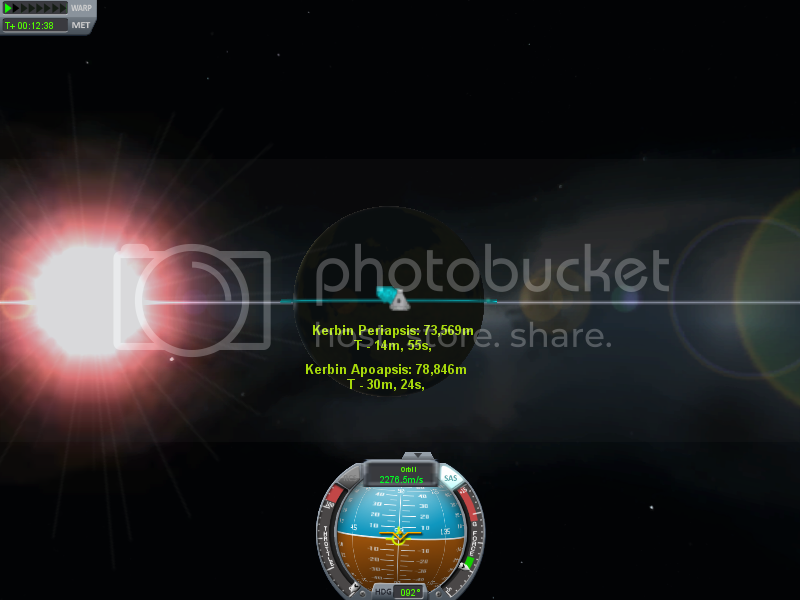 ***Astrokerbal Distinction***, v16 Altitudinalist record, with Exelion. ... v16 Minimalist record holder, with Gnat. bsalis, *Advanced Pilot Precision Award* with 'Helios' and 'Zanix'. ... unique multiflight achievement using player made refuelling mod. SargeRho, Pilot Proficiency Medal with 'S1 Valkyrie'. EndlessWaves, with 'Fifty Tonner' also with Prancing Pony LXIII. T2Cross, Pilot Proficiency Medal, with Pygmy. a7i20ci7y, *Advanced Pilot Precision Award* with 'CircumNavigatorMk1'. T10, *Advanced Pilot Precision Award* with the 'Defiant IVa'. blspblackdeath, ***Astrokerbal Distinction***, *Advanced Pilot Precision Award* with 'Dubble V4 Shuttle'. vXSovereignXv, *Advanced Pilot Precision Award* with the 'X-2'. zekes, with the 'Mexdool 1'. *Advanced Pilot Precision Award* with 'Zokesia Precision Lifter 1'. TheHengeProphet, *Advanced Pilot Precision Award* with 'SF-1', also with the unusual O1-NKR. djnekkid, *Advanced Pilot Precision Award* using runway 27 with 'S01E02'. razgriz86er, *Advanced Pilot Precision Award* with 'Star Ship Noob Prize Stock'. Archangel Lucifer, **Kosmokerbal Commendation**, *Advanced Pilot Precision Award* with the 'White Raven'. Foursh, with 'Space plane 3', v16 Maximalist record holder with 'Delta Wing III'. Good looking spaceplane zombiphylax, I trust I am right to conclude from the above and this that you have actually completed the challenge in accordance with the rules? Can I put you on the Roll of Honour ? 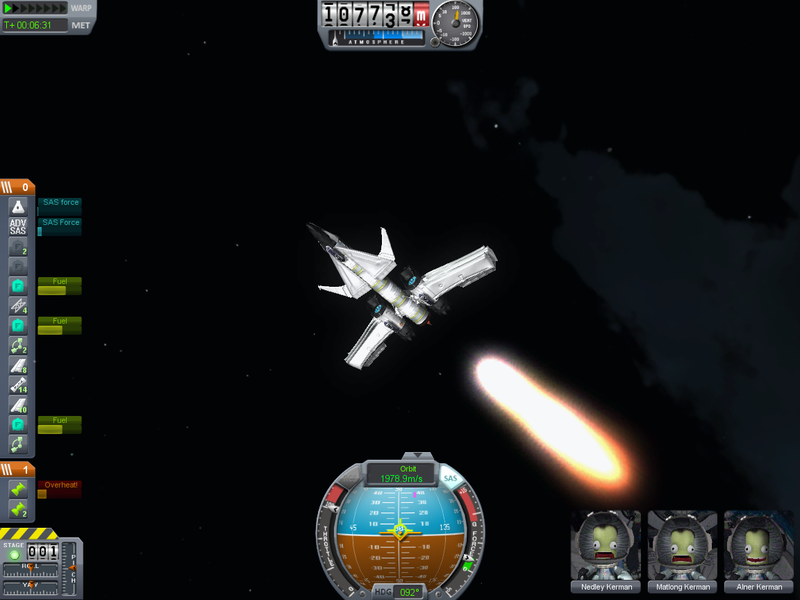 Here is the flight of the StarSpark SSTO Rocketplane. 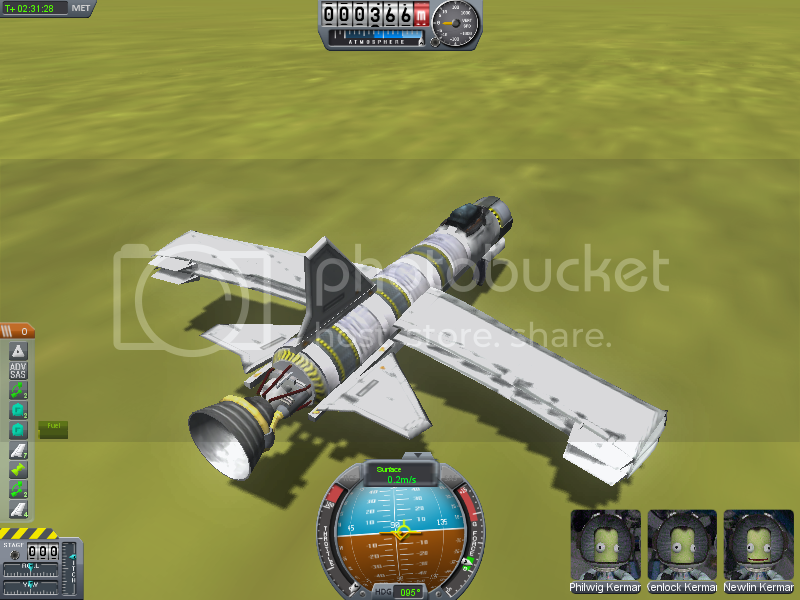 It has only 19 parts, no ASAS or aids other than the cockpit stabilizer, is extremely well balanced and completely reusable. 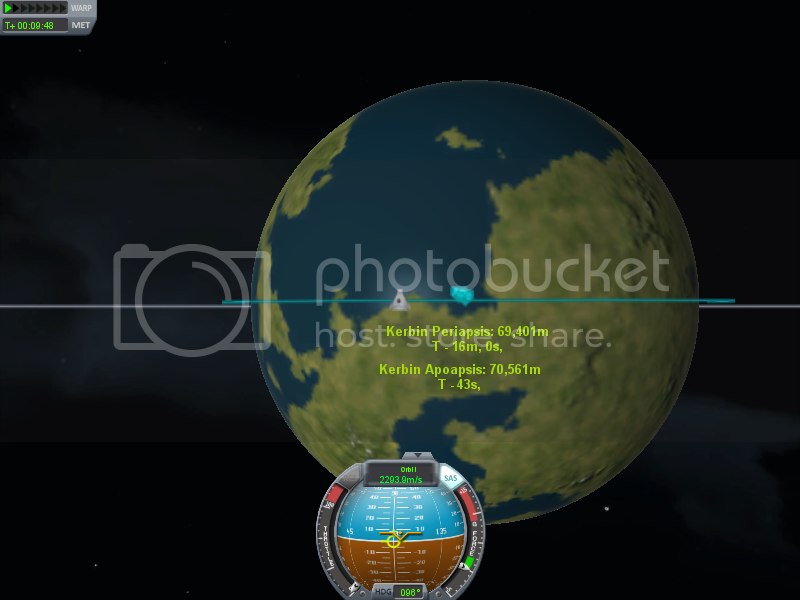 and I think it qualifies me for the smallest ship, highest orbit and closest landing to the KSC so far. That was a real challenge to build and a lot of fun to fly, my earlier models were similar but the balance was always just rearward enough for the planes to keep trying to tumble and eventually to disintegrate in mid air, there was one point where I though that was going to happen to this plane but it stopped just as quickly as it started. Thank you! And I\'d be honored to be listed. 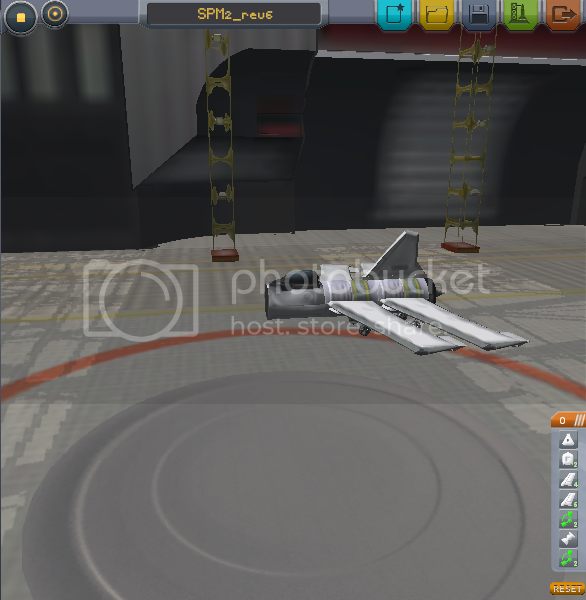 Honestly, I\'ve only had about a 33% successful landing-rate with it though, still need to tinker with wing placement. Alright guys, I need some help. This is my craft, it can reliably get into orbit with about 3/8th\'s of a tank left, which is used to de-orbit. That\'s the problem though, when it de-orbits. It tumbles out of control until it hits the ground. Any tips for making it back through the atmosphere safely? DeadlyPear: I\'d be willing to bet you could take off about half of your wings, which will help balance the weight distribution of your craft. 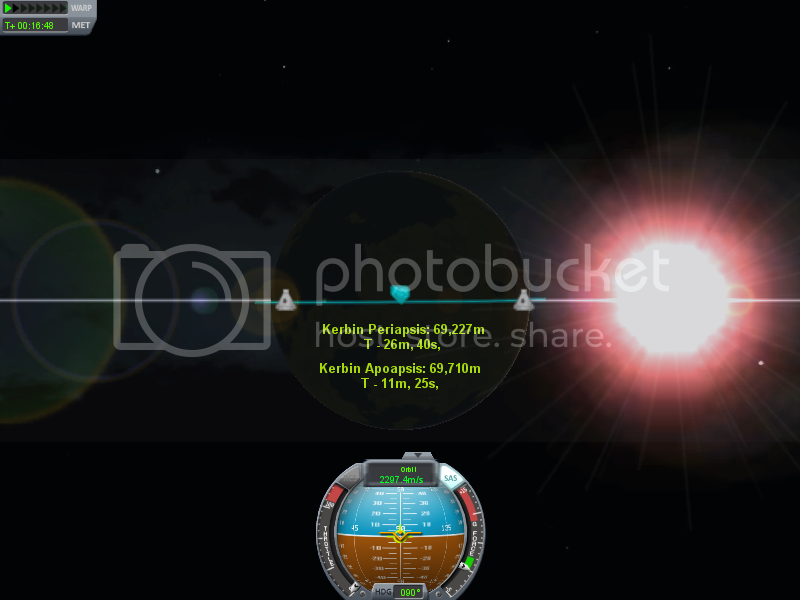 Here is a shot of the original prototype in space with the fuel level, altitude, speed, and periapsis. That\'s fantastic! I\'ll have to play around with that to see if I can cram some RCS on there. 5 normal tanks, 2 turbojets (with intakes), one aerospike, ASAS, and RCS for on-orbit maneuvering. She handles decently well, although she can be a bit squirrely during reentry if you don\'t balance the tanks; likes to go into a flat spin around 9000m. She\'s still manageable, though, as long as you\'re gentle with her. About feeding jets off of rocket tanks: I figure that, because they have to endure more lateral loads, the space plane parts need a bit more structure than the 'flying bear can' rocket parts, hence being heavier and carrying less fuel. In this case, however, the full low wing (see pic #2) provides a structural back for the fuselage, so the extra reinforcement in the tanks isn\'t needed. Either that, or I got tired of trying to balance two fuel systems and took the quick and dirty route, take your pick. As you can see, there\'s quite a large fuel margin left over, this baby should be able to handle a decent amount of payload (if I could figure out a good way to mount it, a radial decoupler on the back puts it too far off the CG) and she can reach quit high orbits. Alright, I\'ve done it! 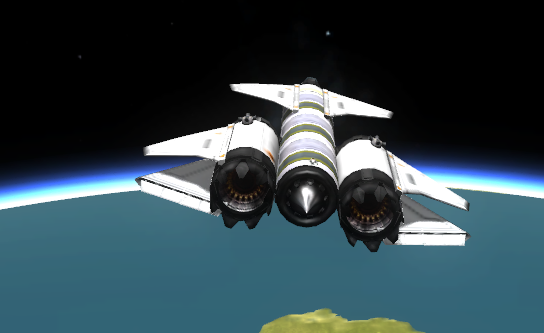 I present, the Lunacy SSTO! 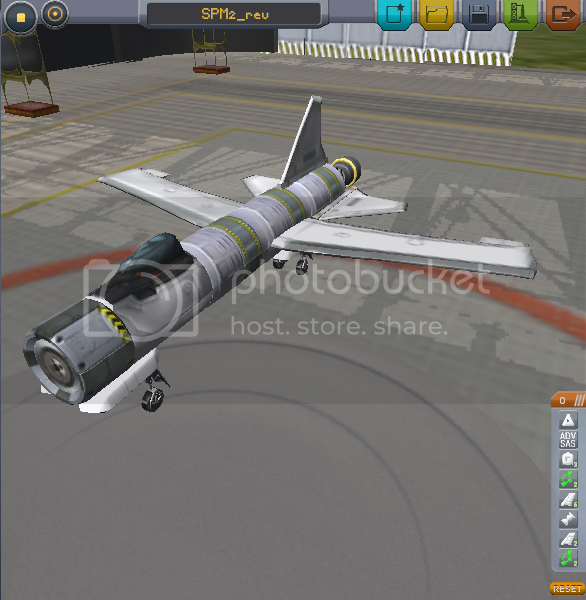 It\'s a simple craft (kinda) with two jet engines and a radial spike engine attached to 4 tanks of liquid fuel. It can get into an orbit of 100kmx100km easily with enough fuel to de-orbit in the desired continent. 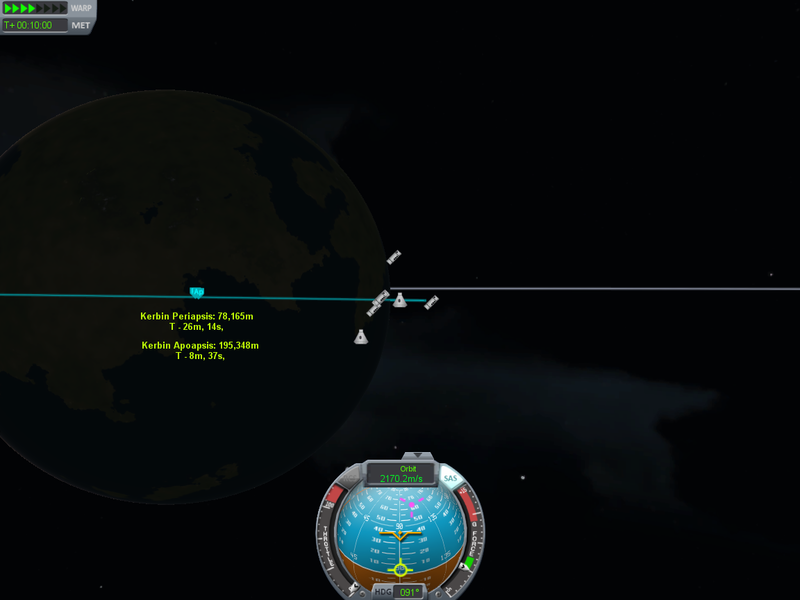 When you deorbit, you are left about half a tank of jet fuel to each engine, allowing for the ability to go a short distance if you are near KSC. Only 225m difference between Pe and Ap, without the use of RCS. On Final Approach and everything looks good. Rolled to a comfortable stop near the end of the runway. Touchdown was somewhere near the middle. It\'s a simple design, but it works well for me. Alright, so tweaked it just a bit for RCS controls while in orbit. Wonderful design! Very simple, and was easy to balance when recreating, just had to trim some weight so it could lift to extra tank. 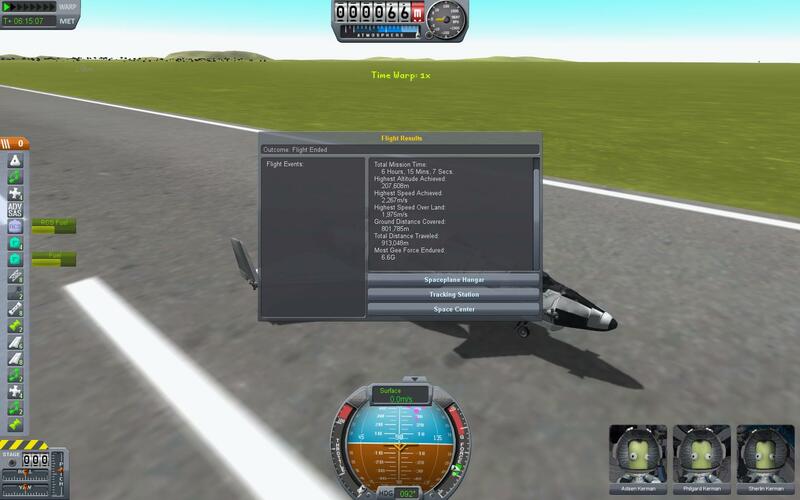 17 parts, takeoff weight as equipped is 8.78. * Flying it to orbit is remarkably unfun. It does at least have an incredible TWR, and handles nicely once empty. Remember to throttle down during ascent. 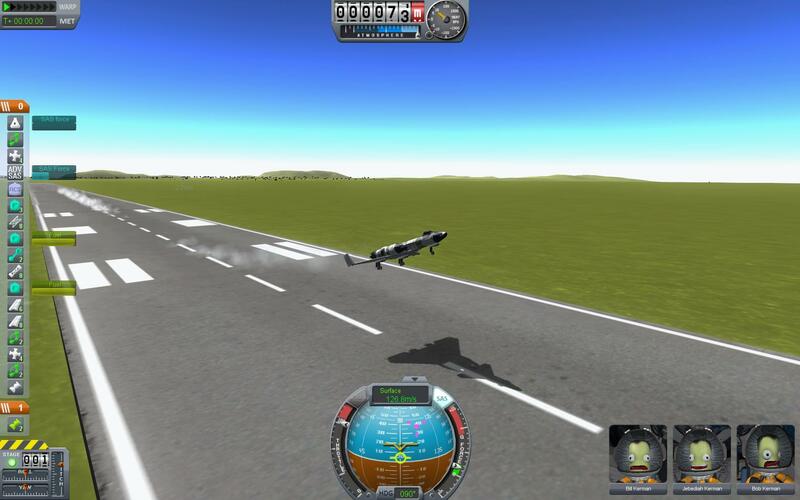 There\'s not enough fuel for much maneuvering, but it can glide a fairly long ways. *It would be 10.78, but landing gear are massless. UmbralRaptor, thats a great little ship, you deserve a place on the roll of honour and to be added to Kay Kool\'s bouncer\'s guest list, he is quite big for a Kerbal. However, did you notice the PE is below 70,000? It just wouldn\'t be fair to take mager42s minimalist title away without a more persuasive screeny!